Ganjaku castle (岩石城) is built at the top of Ganjaku mountain, a beautiful corned shaped one of about 350 meter from hillside at the east of central Soeda town. 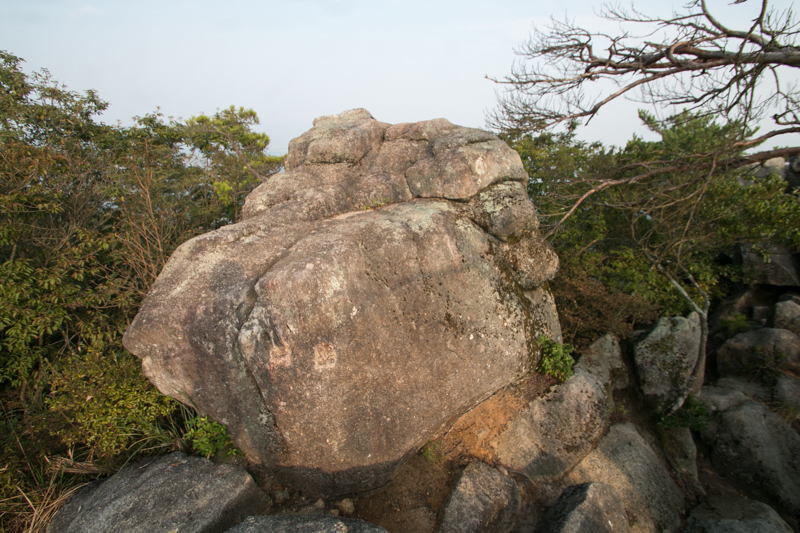 Ganjaku means craggy, and there are many rocks around the mountain. 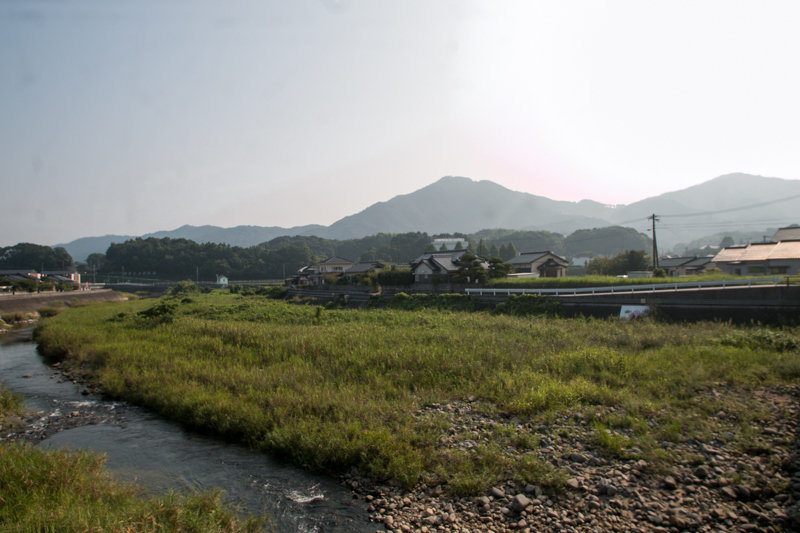 Soeda town is located at the tip of the valley formed by Hikoyama-gawa river, a tributary of Ouga-gawa river which flows from Hikosan mountain. 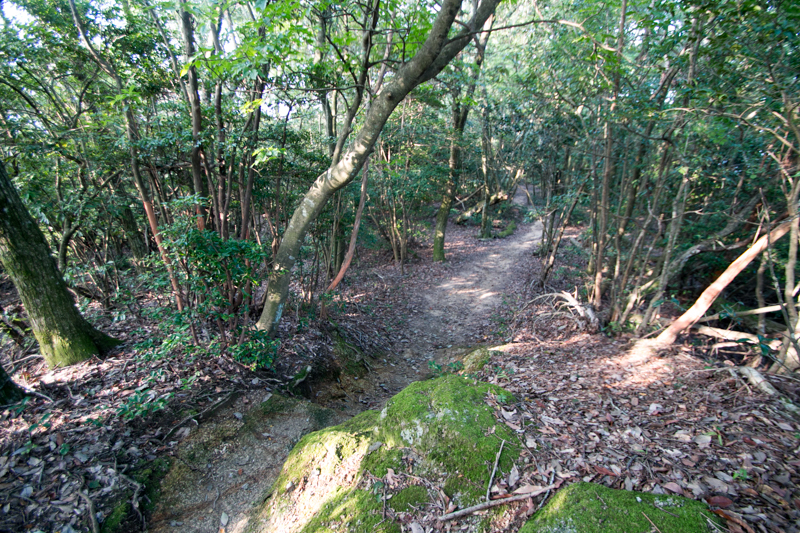 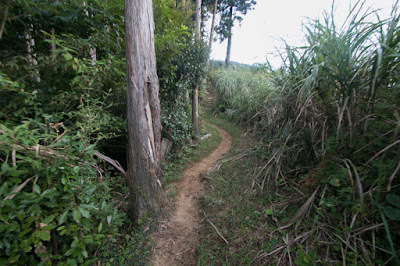 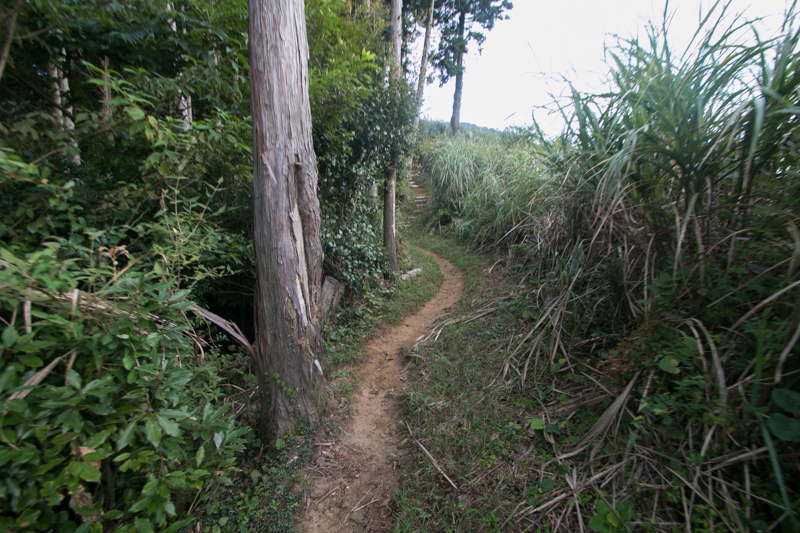 Different from current border, formerly the line of Ouga-gawa river and Hikoyama-gawa river was the border of Buzen province and Chikuzen province. 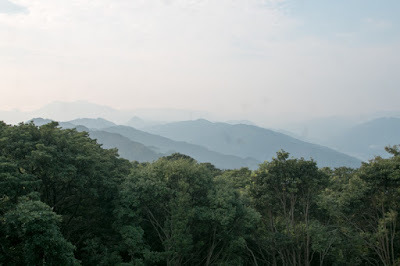 Soeda town itself is a quiet mountainous valley but it locates at the southeastern border of Buzen province, which faced Chikuzen province at westward and Bungo province at southward. 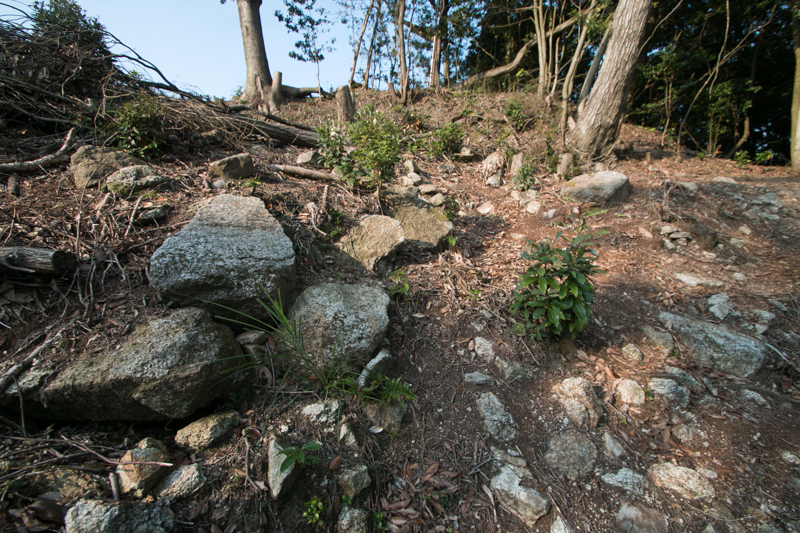 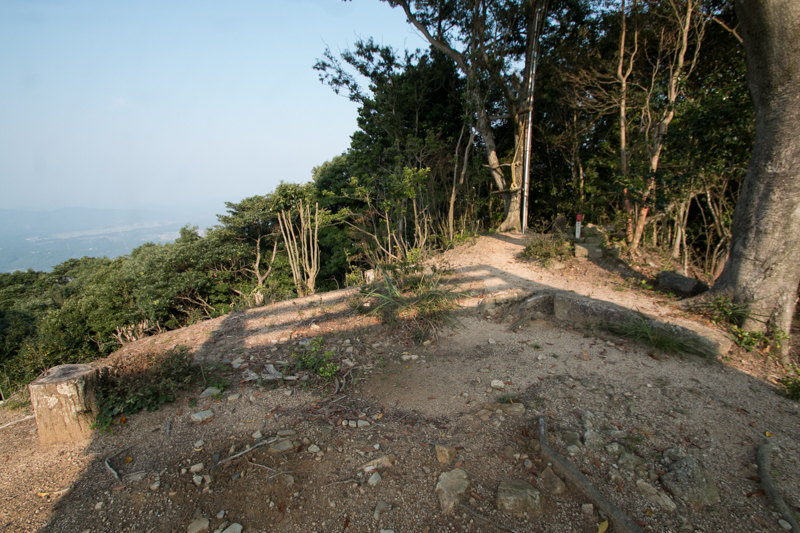 Ahead of the road along with Imagawa river from coastal area, Ganjaku castle was an important place to guard the border, along with Hikosan mountain which formerly held temple and monk army. 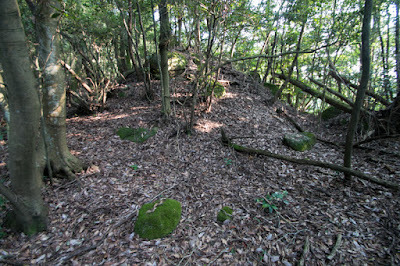 Precise year is unknown but it is said that Ganjaku castle was built by Kagechika Oba (?-1180) under the order of Kiyomori Taira (1118-1181), a military noble who achieved authority after the battle of Heiji in 1169. As the source of Taira clan was profit from trade with Chinese Song dynasty, Kiyomori thought important of naval supremacy at Setonaikai Sea, and Hakata city as a trading port. To protect Hakata city, Kiyomori took the position of Dazai-Daini, the governor of Hakata city, and seized vast territory around Hakata city such as Chikuzen province, Buzen province (Fukuoka prefecture) and Hizen province (Saga prefecture). 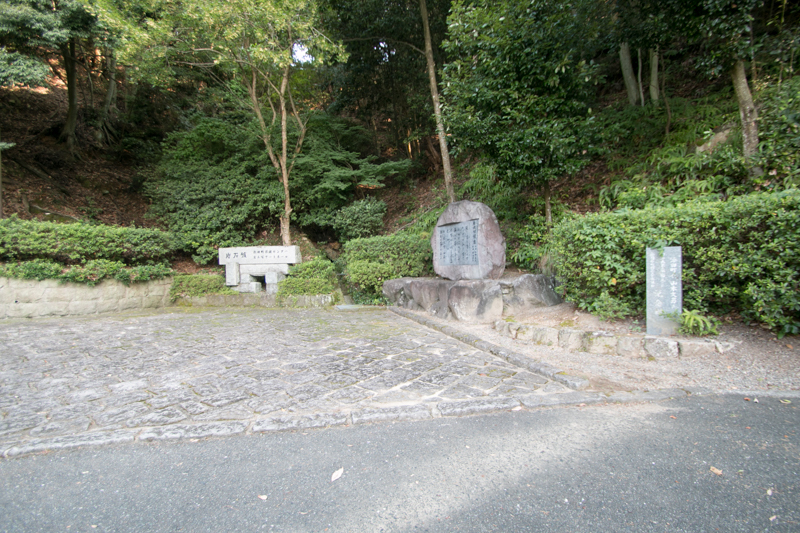 But Kagechika was killed by Yoritomo Minamoto (1147-1199), the leader of Minamoto clan and raised his army against Kiyomori, and the Taira clan which lost their power after the death of Kiyomori ruined at the battle of Dannoura in 1185. After the fall of Taira clan, Kamakura Shogunate gave Buzen province and Bungo province including Ganjyaku castle Otomo clan. 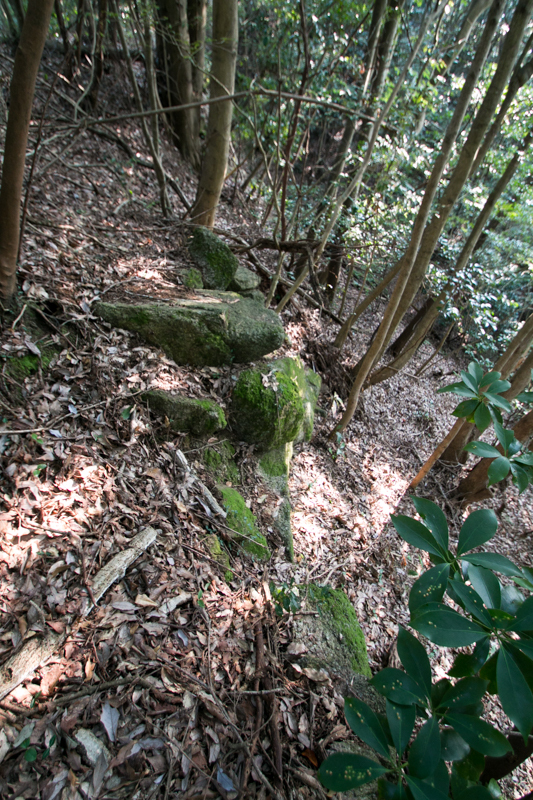 Later Otomo clan moved to Bungo province and became the local lord in the latter half of 13th century, but their dominance of Buzen province was only nominal one. 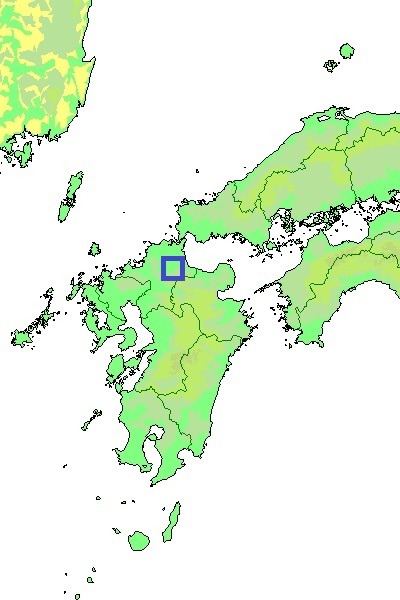 On the other hand, after the fall of Kamakura Shogunate, Ouchi clan which was the governor of Suo province and Nagato province (Yamaguchi prefecture) expanded their power into north part of Kyushu island including Buzen province. Now Buzen province became the target of struggle between Ouchi clan and Otomo clan. 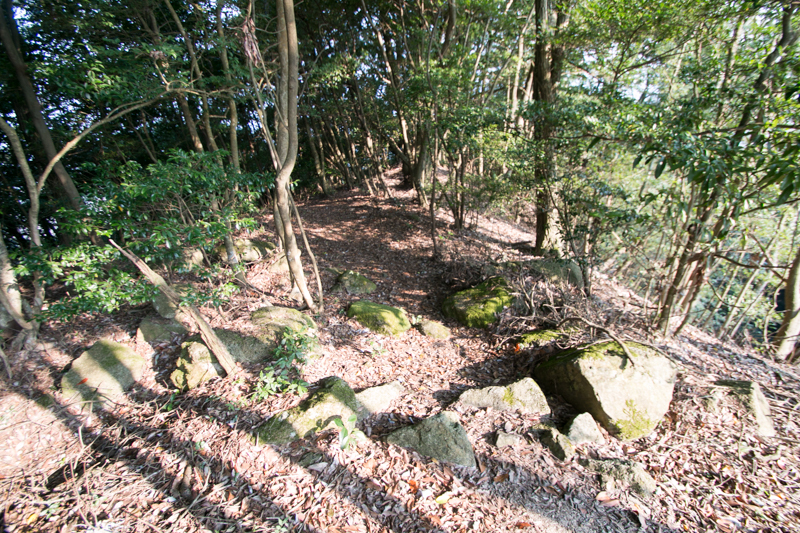 In the latter half of 14th century, Ouchi clan which seized Buzen province placed Oba clan which might be a descendant of Kagechika Oba at Ganjyaku castle. In 1399, probably looking at the trouble of Ouchi clan at the battle of Oei, Ujishige Otomo who rebelled to main family once captured Ganjaku castle expelling Oba clan. 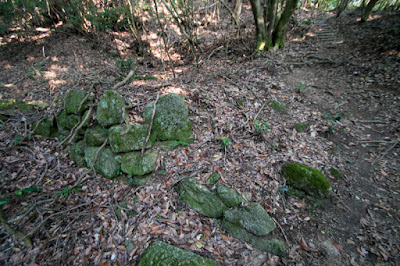 But next year Ouchi clan recovered Ganjaku castle and placed Oba clan again. 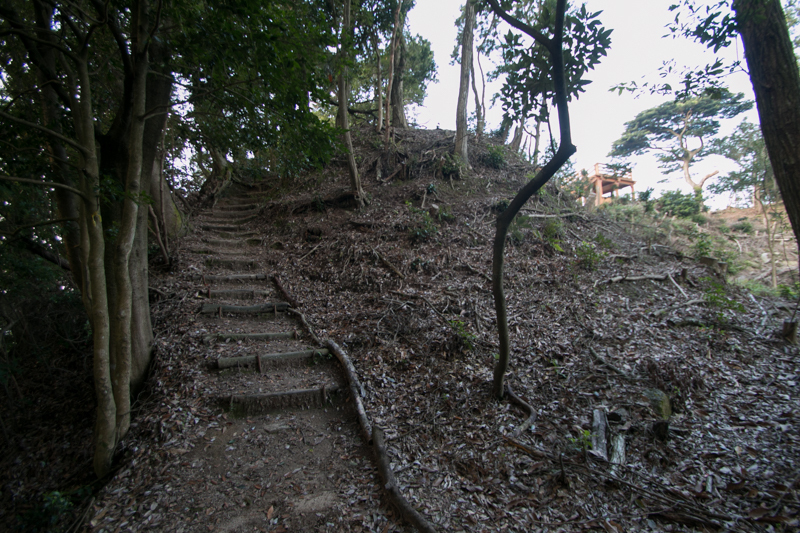 Oba clan held Ganjaku castle over 100 years, but in 1551, their master Ouchi clan substantially ruined at the incident of Daineiji, a coup d'etat by their general Harukata Sue (1521-1555). Yoshishige Otomo (1530-1587), the leader of Ouchi clan, supported Harukata in exchange of the territory of Ouchi clan at Kyushu island, then Otomo clan captured Ganjaku castle. Otomo clan prospered as the ruler of north half of Kyushu region, but started to decline after the defeat at the battle of Mimikawa against Shimazu clan in 1578. 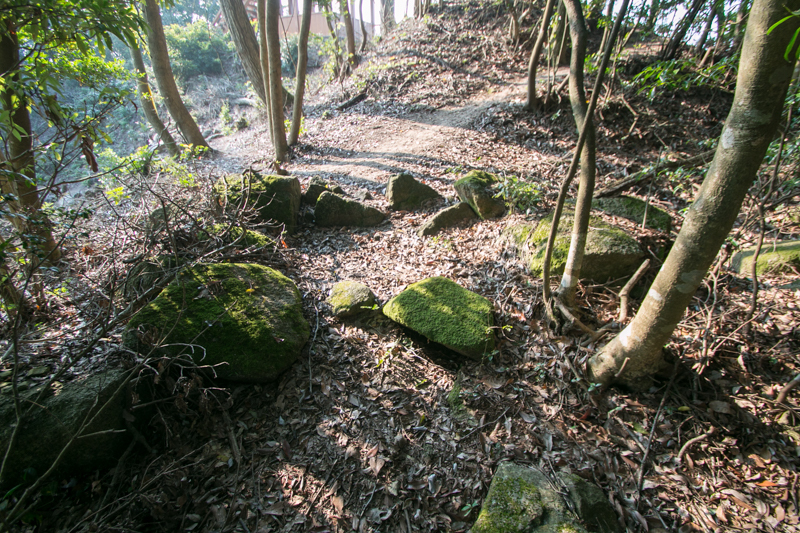 Looking at this opportunity, Tanezane Akizuki (?-1596) who was the lord of Koshosan castle (Fukuoka prefecture) at the next of Soeda area rapidly grew into a strong warlord of the area. 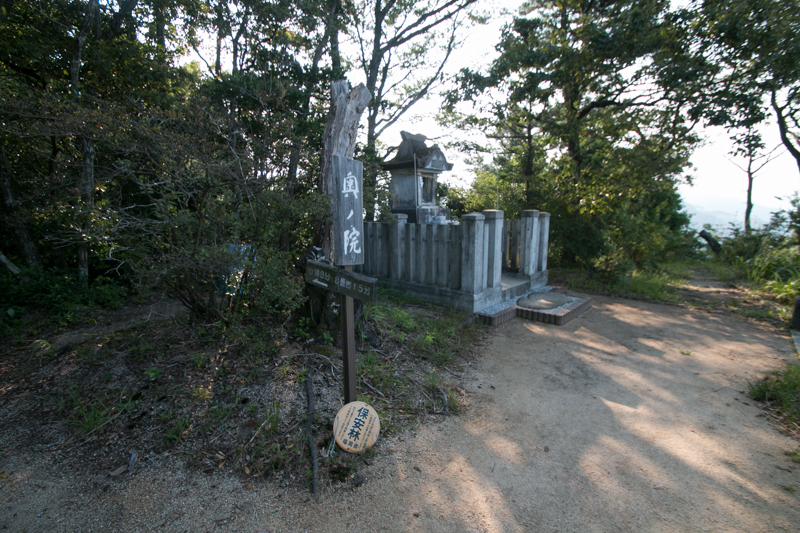 Akizuki clan was a traditional local lord stem from central noble Haruzane Okura (?-? 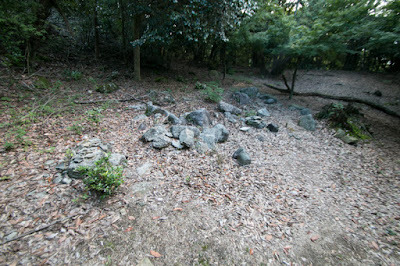 ), who subjugated the rebellion of Sumitomo Fujiwara (?-941) in 10th century. 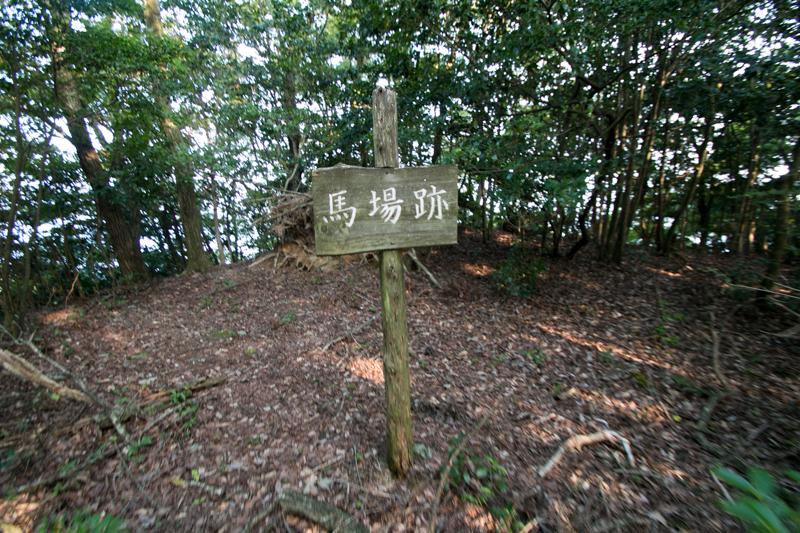 Akizuki clan originally belonged to Ouchi clan, but after the fall of Ouchi clan once followed to Otomo clan. But in 1557, Fumitane Akizuki (1512-1557), the leader of Akizuki clan, left Otomo clan and turned to Mouri clan which was the warlord of Aki province (Hiroshima prefecture) and proceeded into north part of Kyushu island. 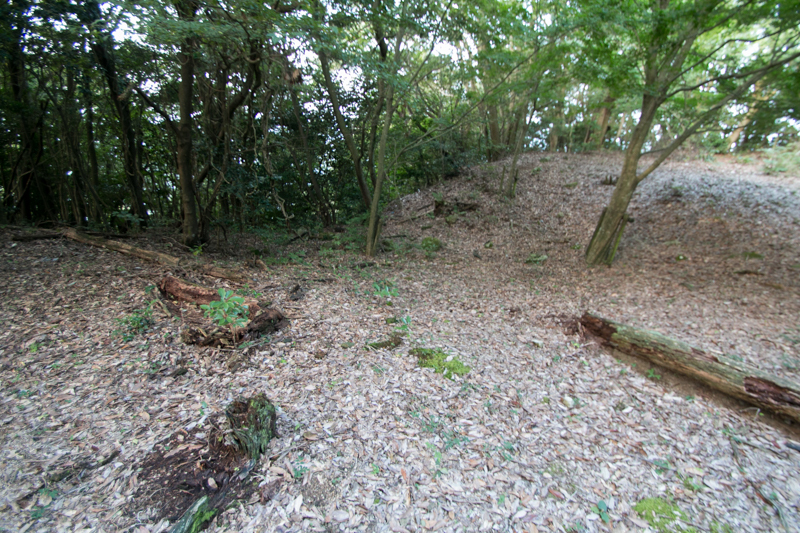 But this time Otomo clan attacked Koshosan castle with dominant army and Akizuki clan once ruined. 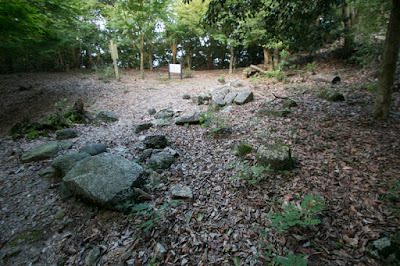 Later Tanezane Akizuki (?-1596),who was the son of Fujitane and survived the battle, returned to former territory and restored the clan. Tanezane once belonged to Otomo clan, but looking at the rebel of important generals of Otomo clan such as Akitane Takahashi (1529-1579) who was the lord of Homanyama castle or Akitoshi Tachibana (?-1568) at Tachibanayama castle under the support of Mouri clan, Tanezane also raised against Otomo clan. 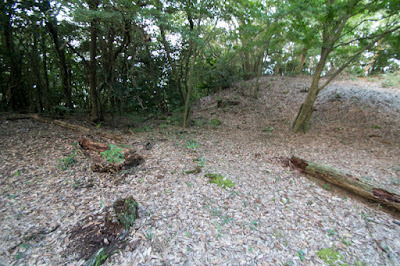 But this time Otomo clan finally suppressed these rebellion after tough battles, and Tanezane surrendered to Yoshishige Otomo. 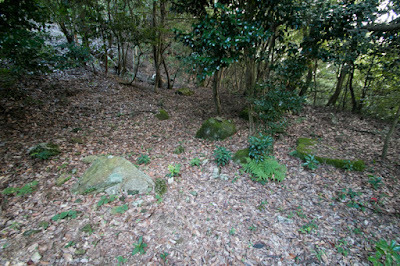 However, looking at the fall of Otomo clan at the battle of Mimikawa in 1578, Tanezane allied with Shimazu clan and captured neighbor territory of Otomo clan. 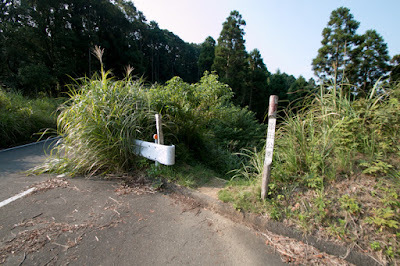 Being defeated several time before Dosetsu Tachibana (1513-1585), an excellent general of Otomo clan, Tanezane increased his territory around Buzen province by sending his son as successors of Takashi clan or Nagano clan. 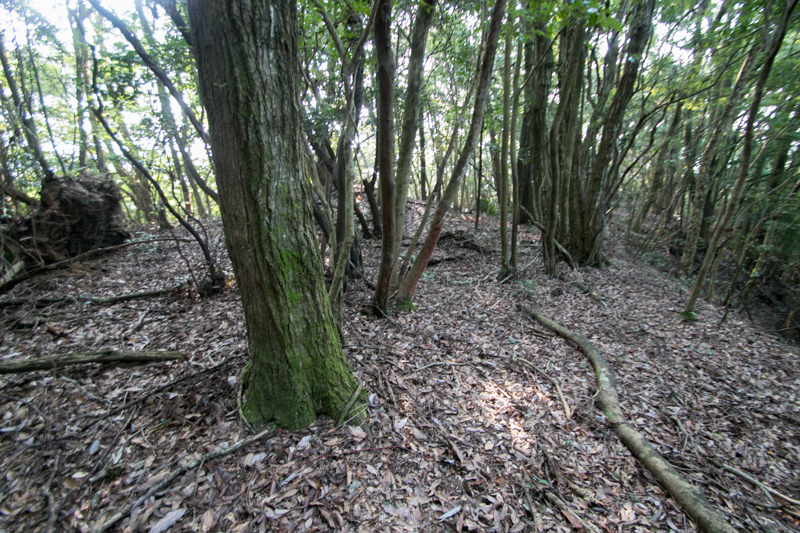 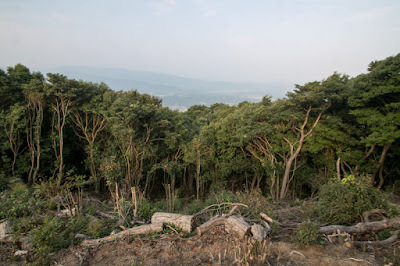 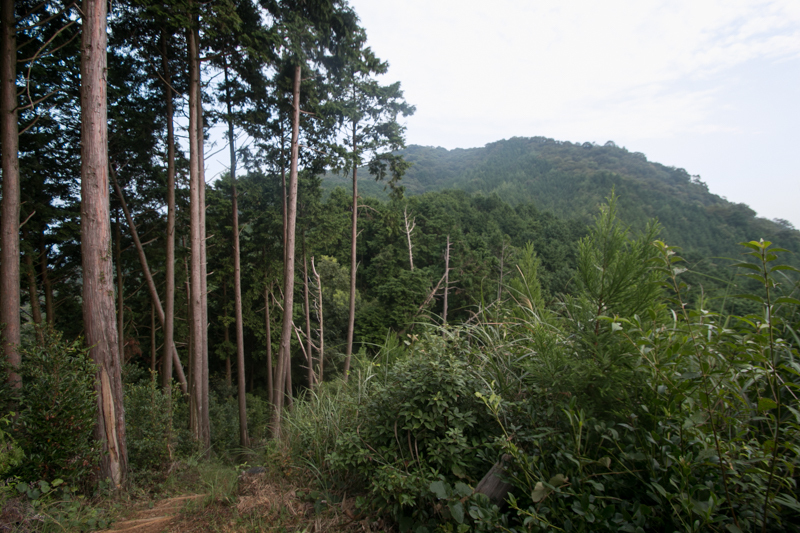 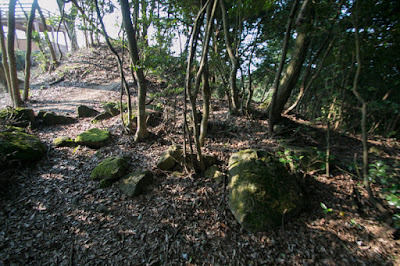 After the death of Dosetsu, Otomo clan could not protect their territory any more, and Tanezane had a vast territory. 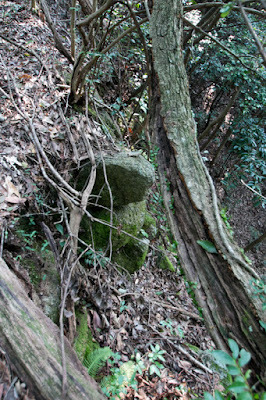 Tanezane strengthened Ganjaku castle as fort against Otomo clan. 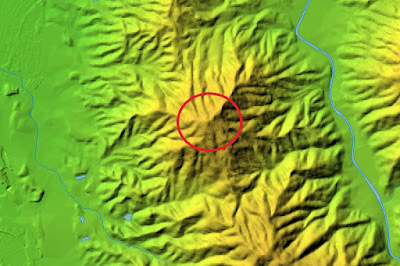 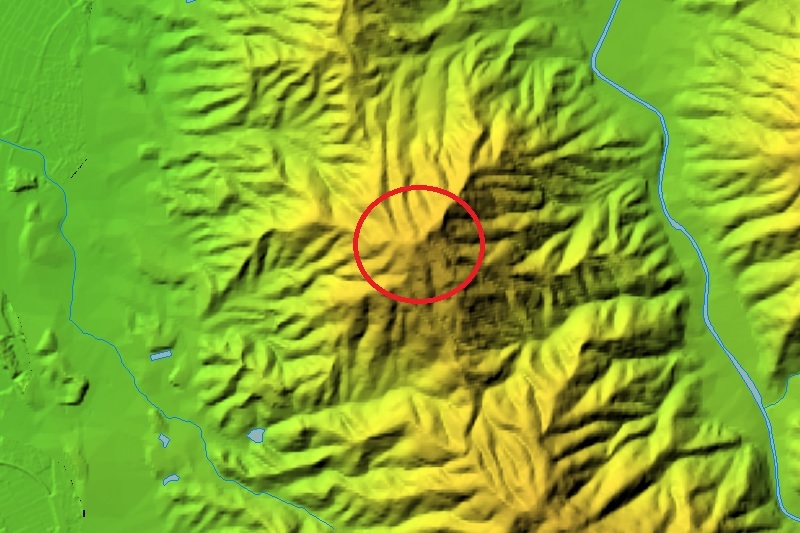 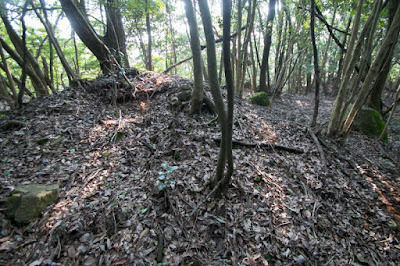 Ganjaku castle spreads over ridges radially prolonged from the peak. 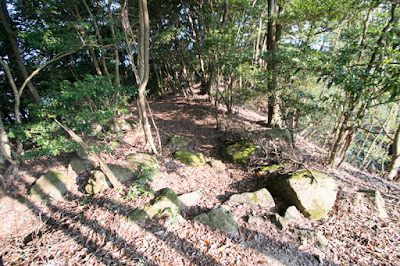 At the peak there is a small terrace of 40 meter long and 10 meter wide called as a watchtower basement, which might have stone wall at its gate. Just the below of this terrace, there is a L letter shaped central area of 60 meter long. 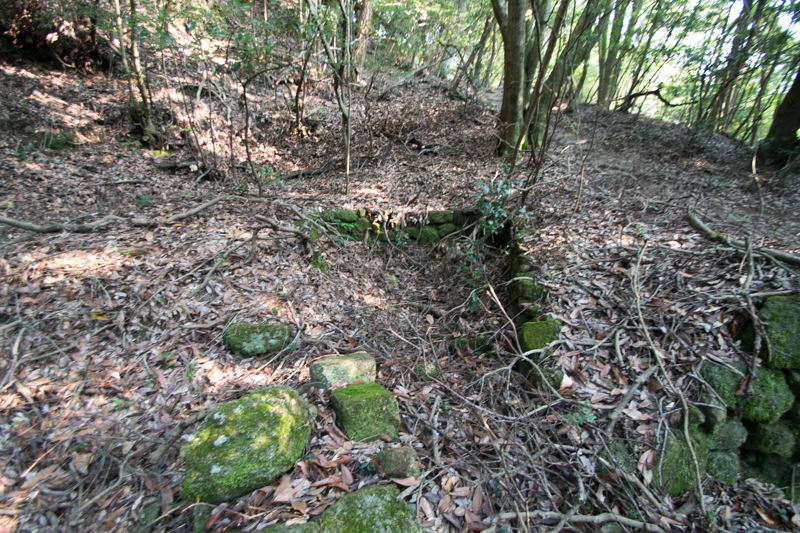 There is a slight hollow which might be a ruin of Masugata style gate, and also wreck of stone wall might protect this gate. 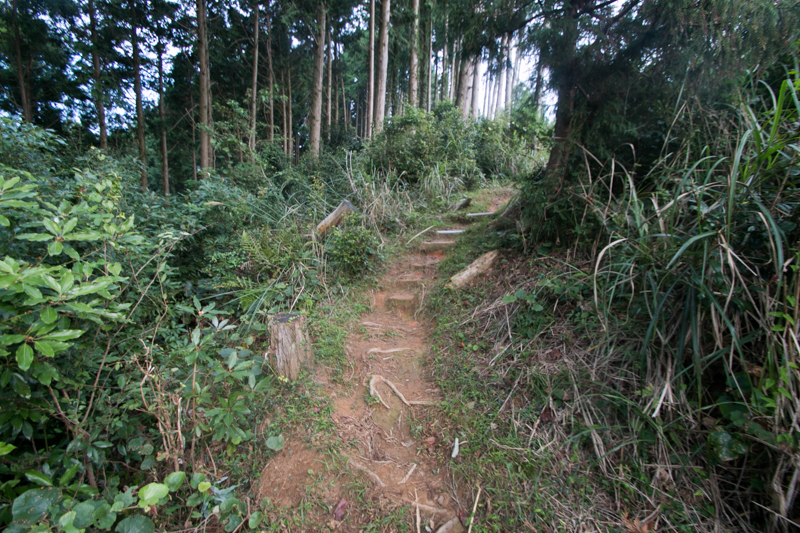 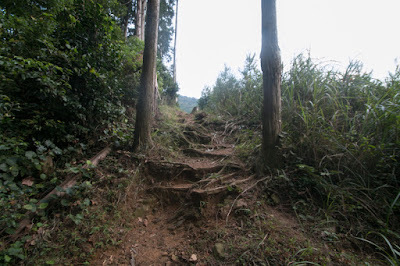 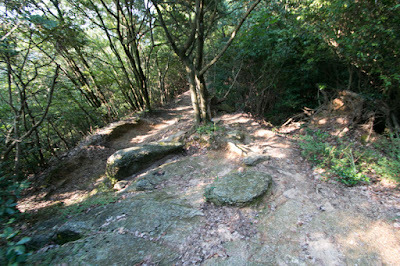 At the northeast of central area, there is a long and narrow flat terrace called as riding place. 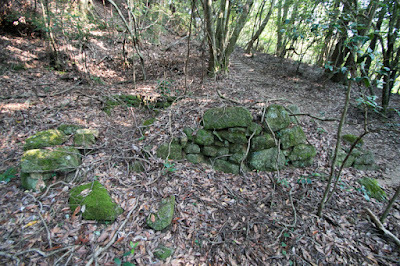 At the sidewall of this terrace ruin of stone wall slightly remain. 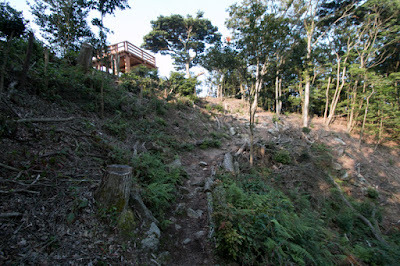 On the end of this terrace, huge natural rocks used as a natural gate and watching place exist. 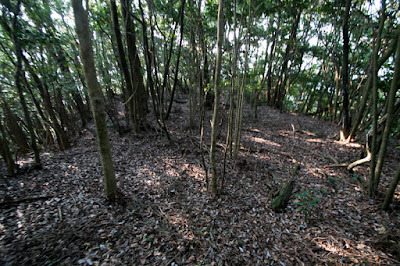 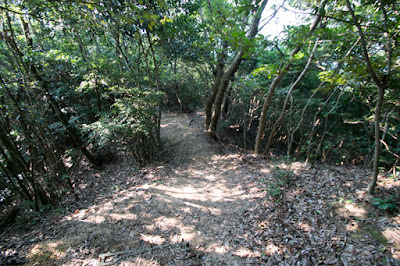 At the southeast of central area, there is also a long and narrow terrace called as secondary area. 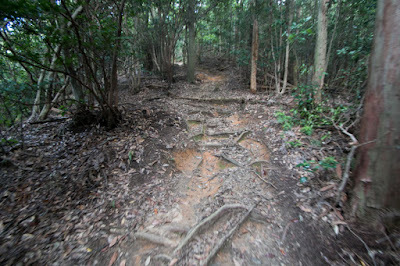 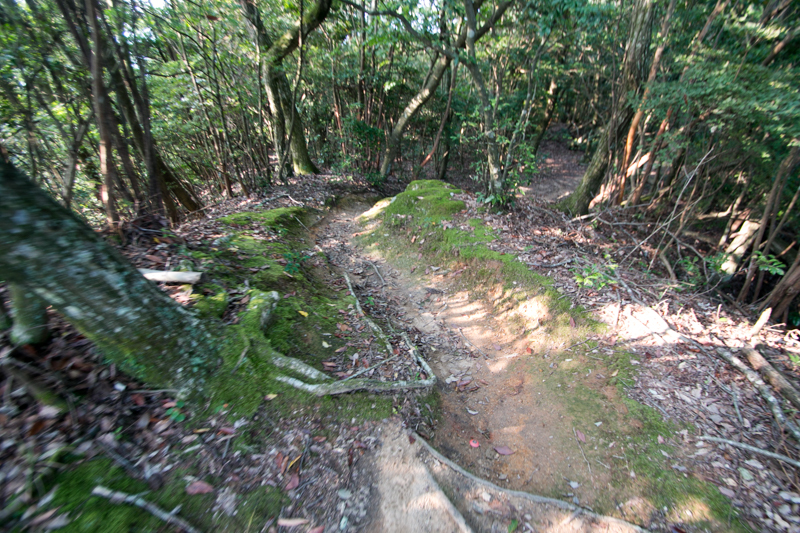 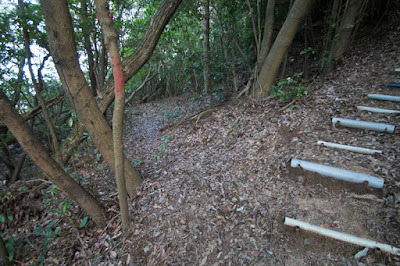 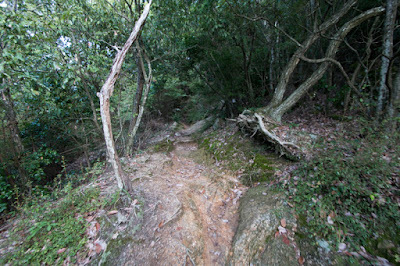 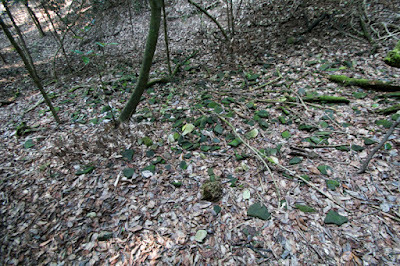 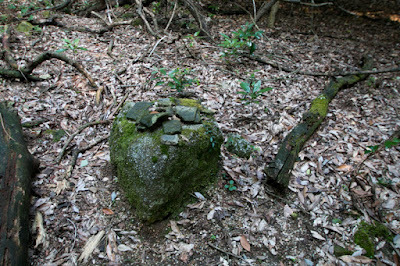 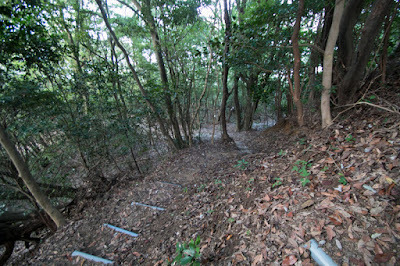 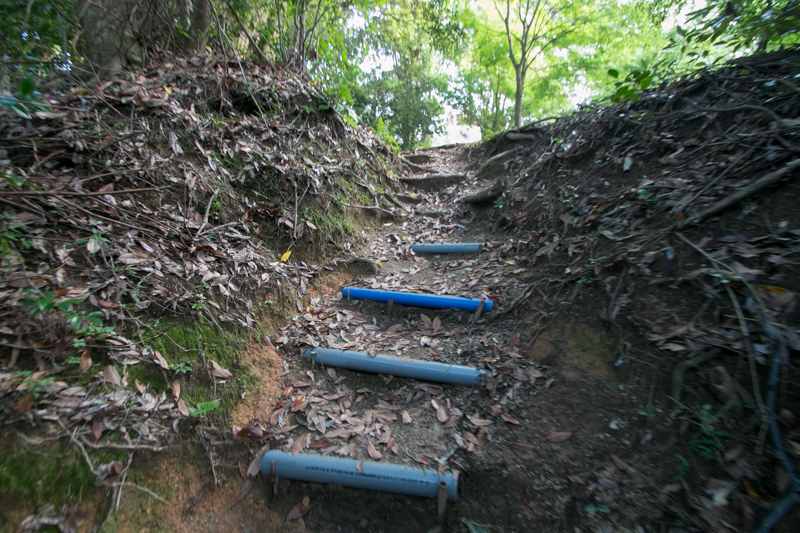 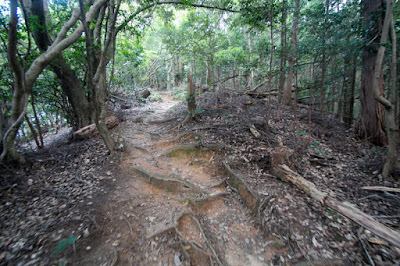 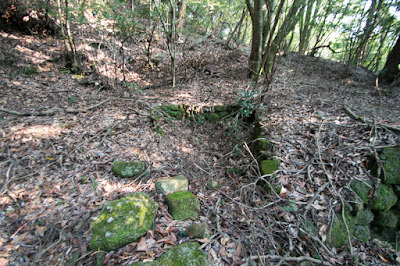 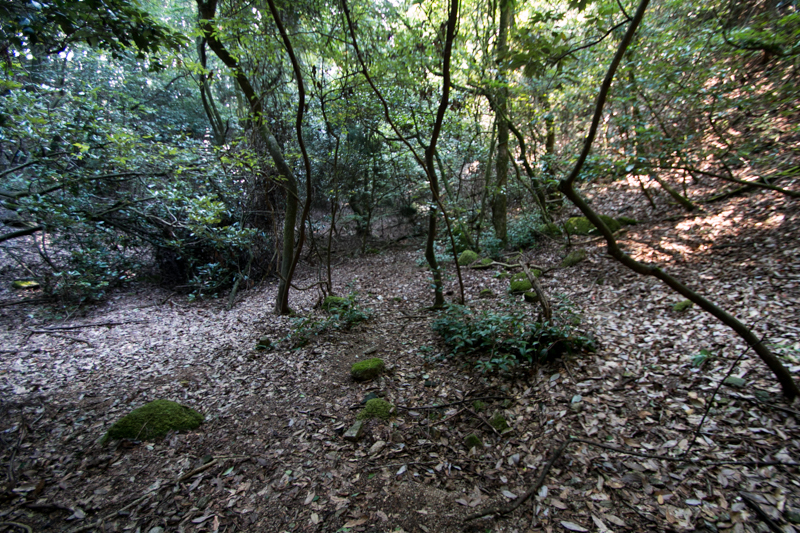 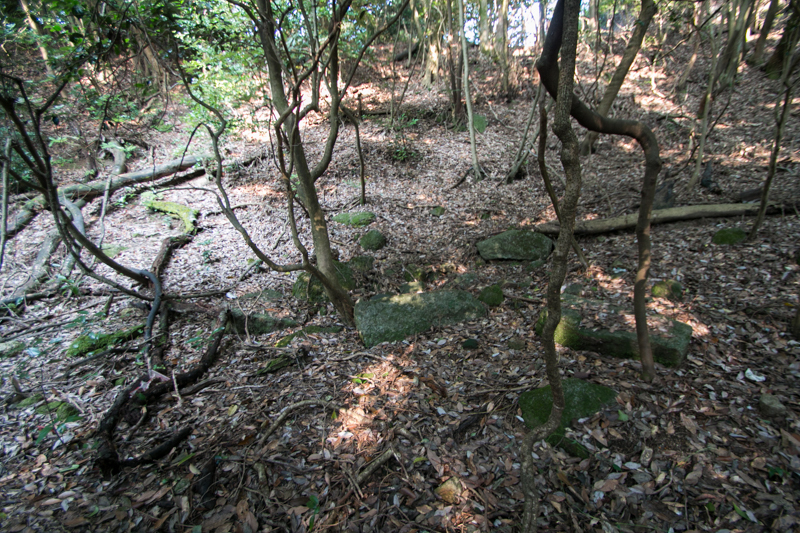 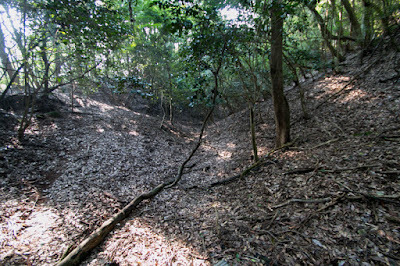 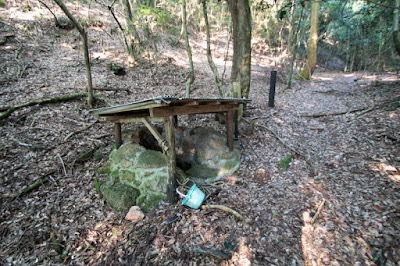 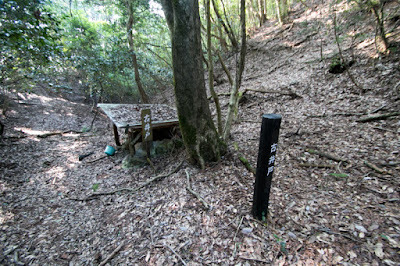 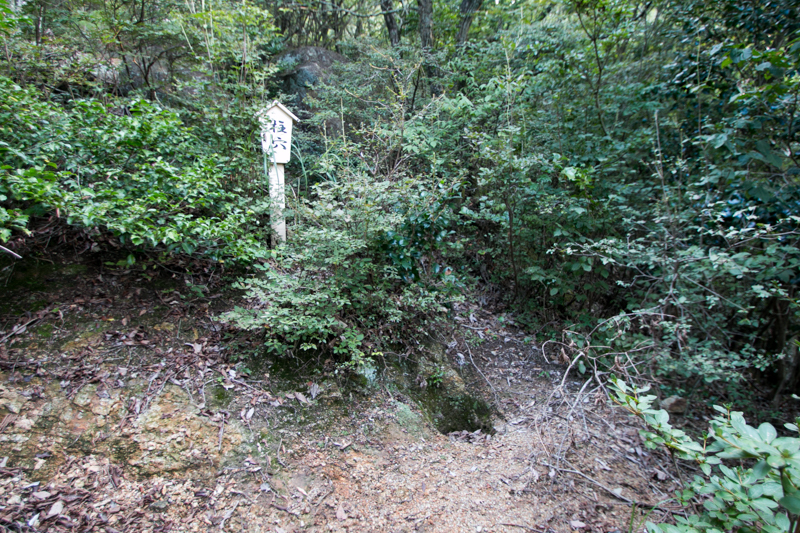 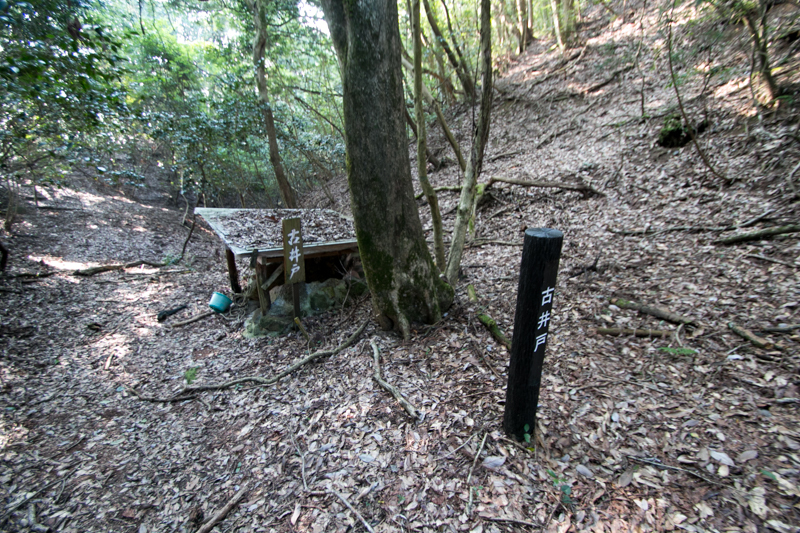 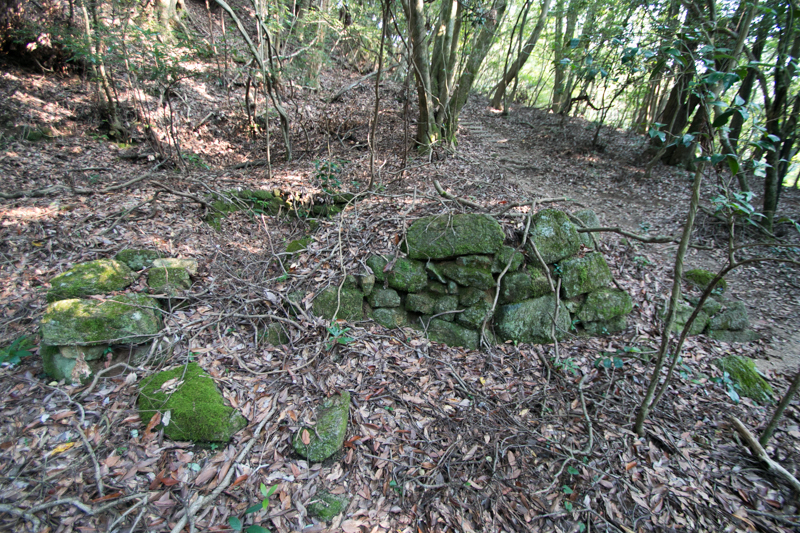 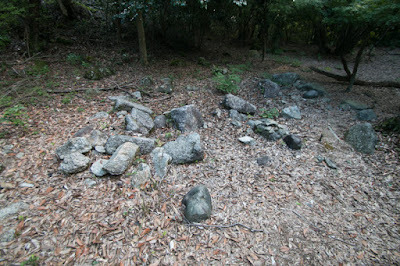 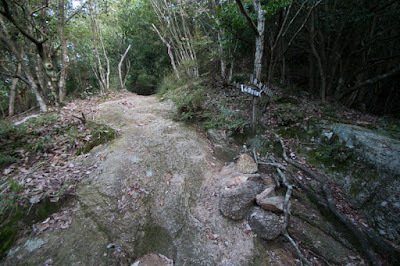 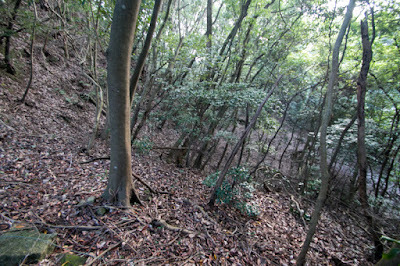 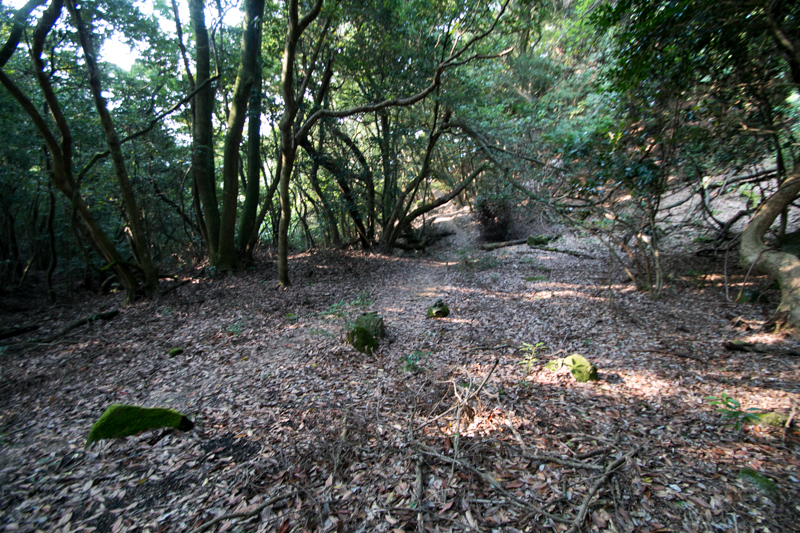 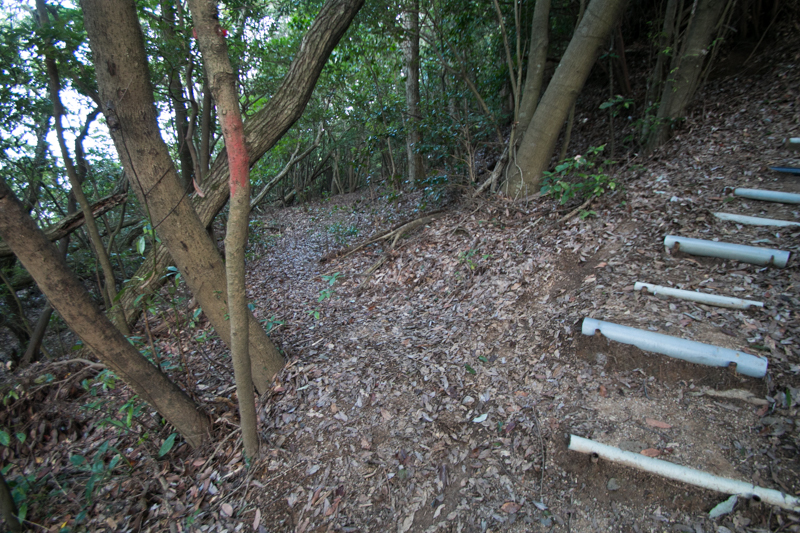 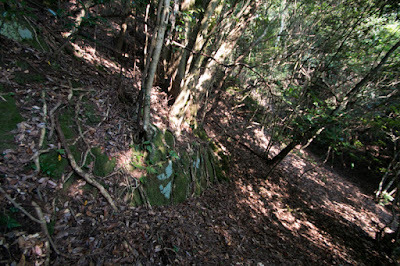 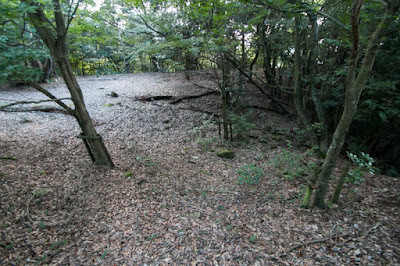 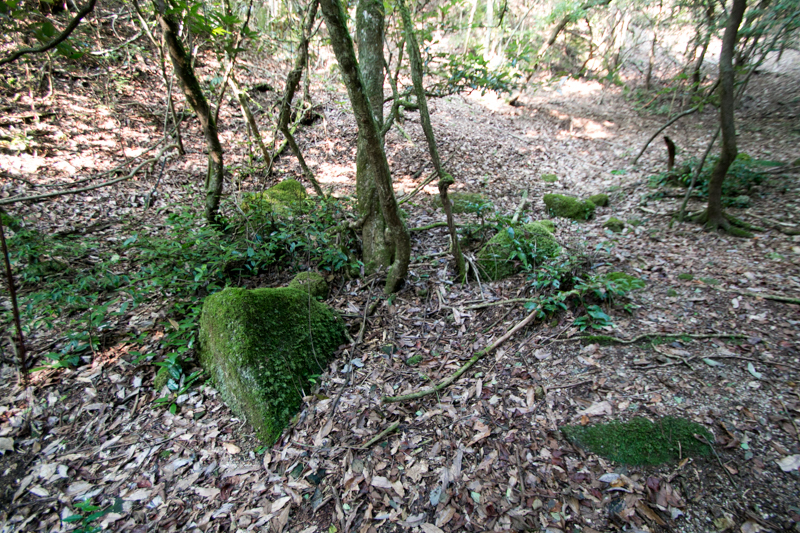 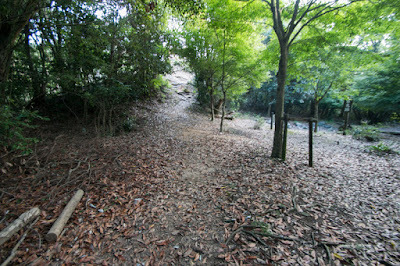 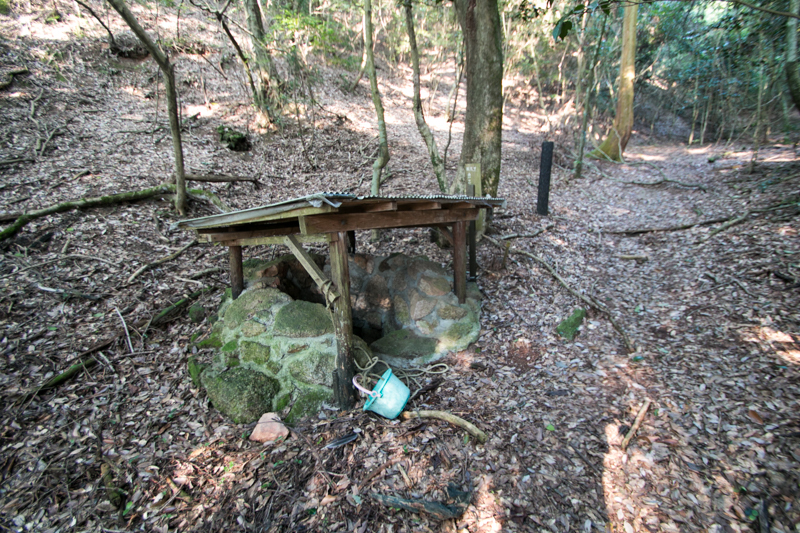 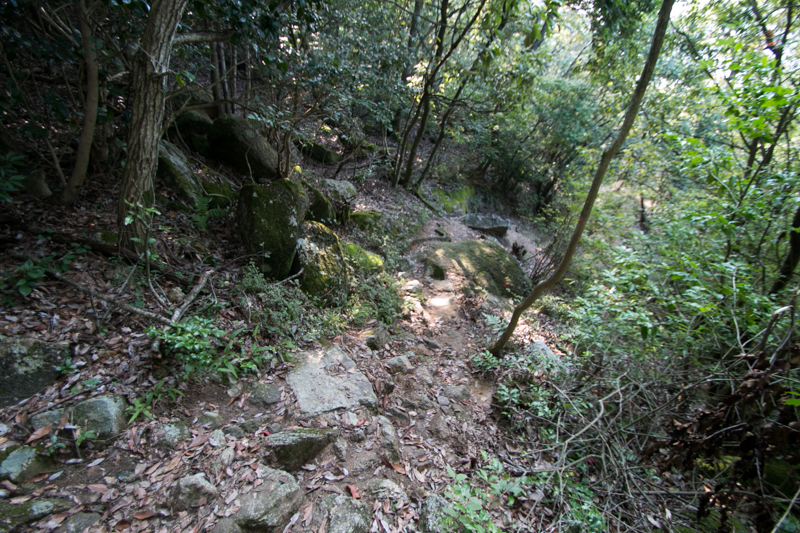 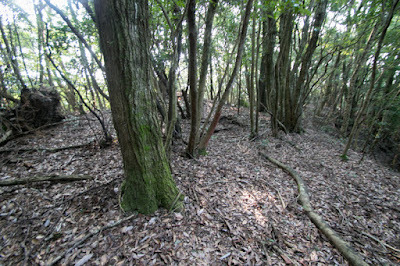 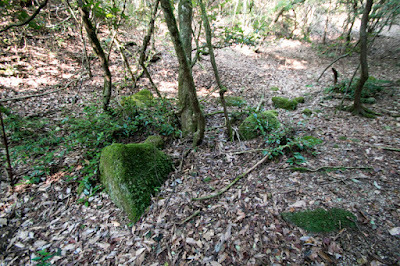 At the valley between riding place and secondary area, there is a ruin of old well. 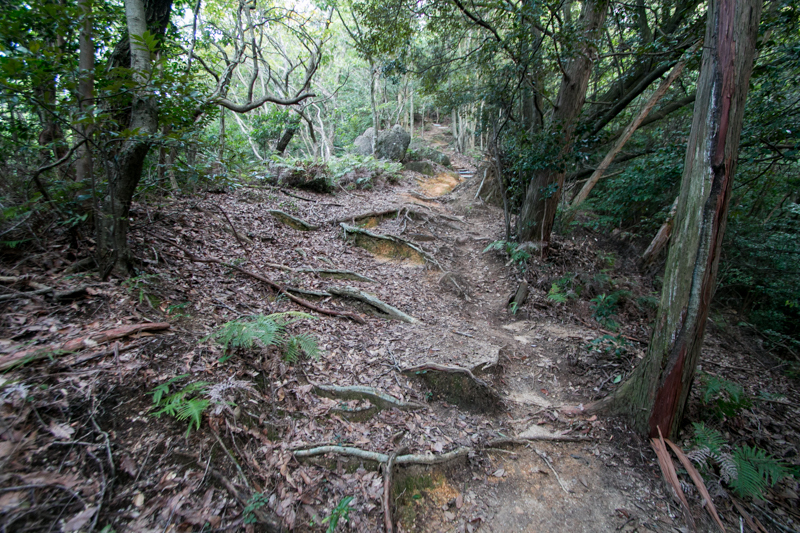 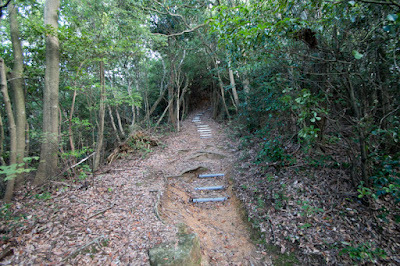 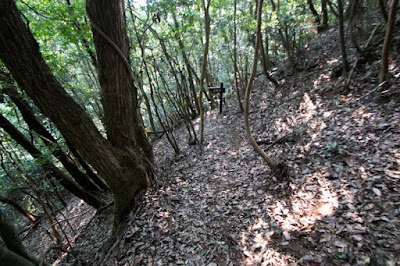 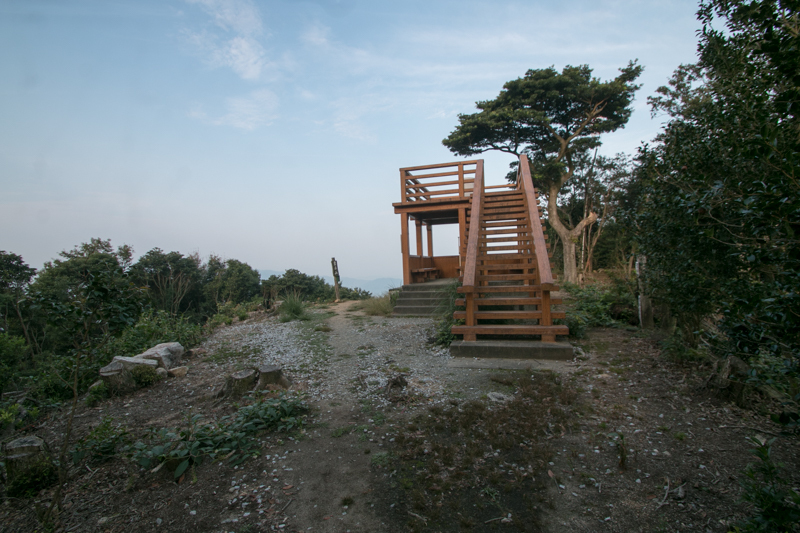 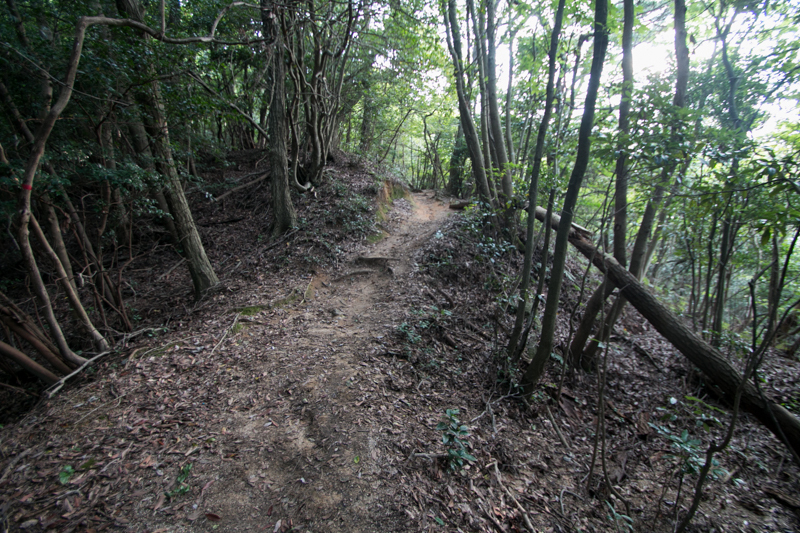 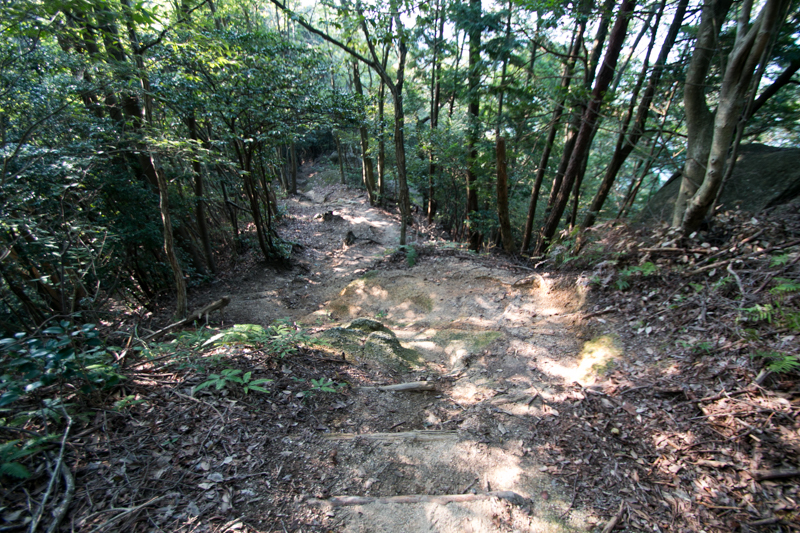 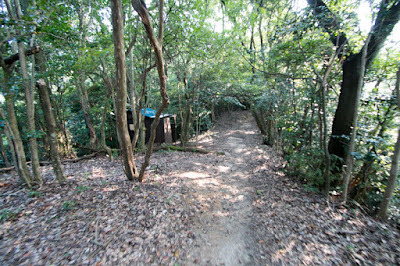 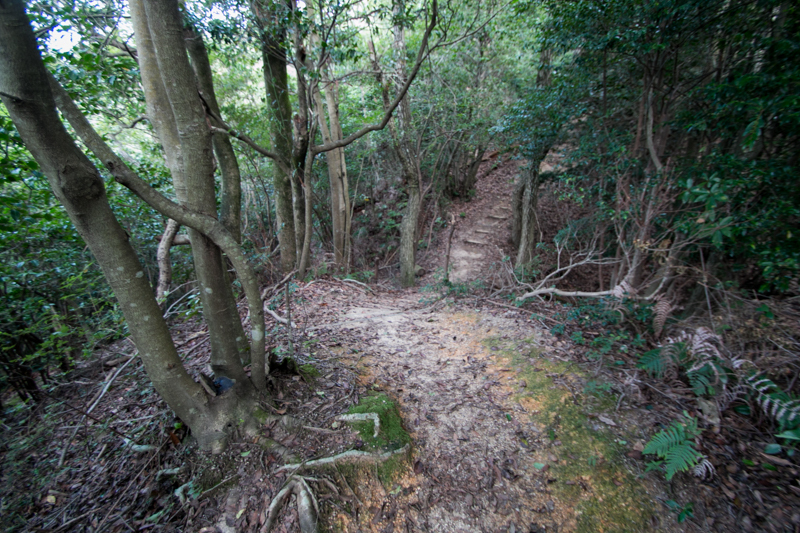 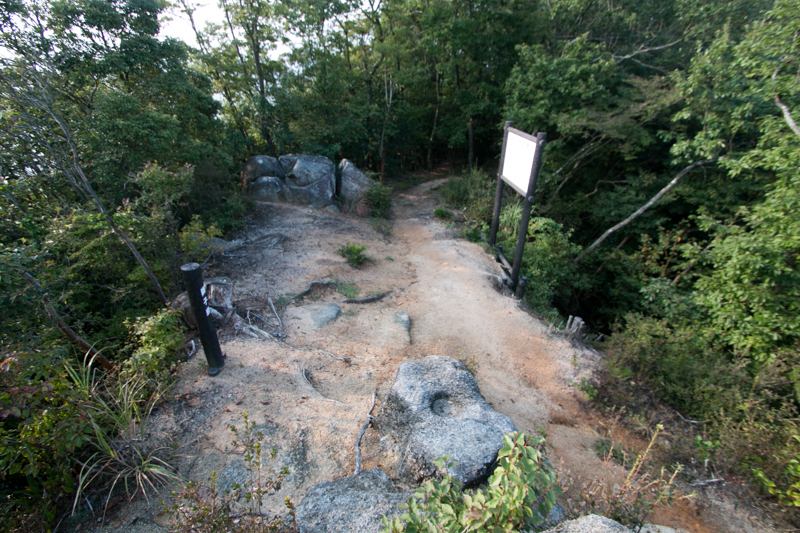 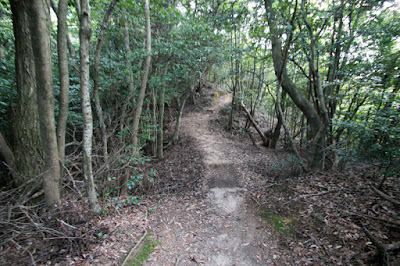 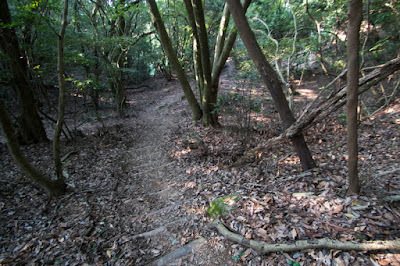 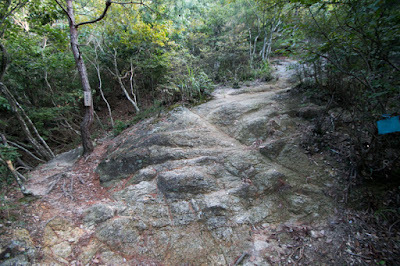 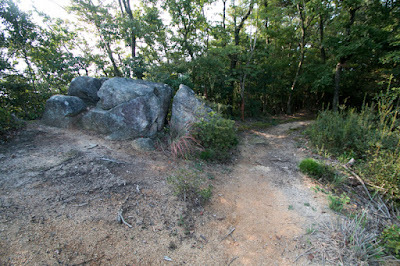 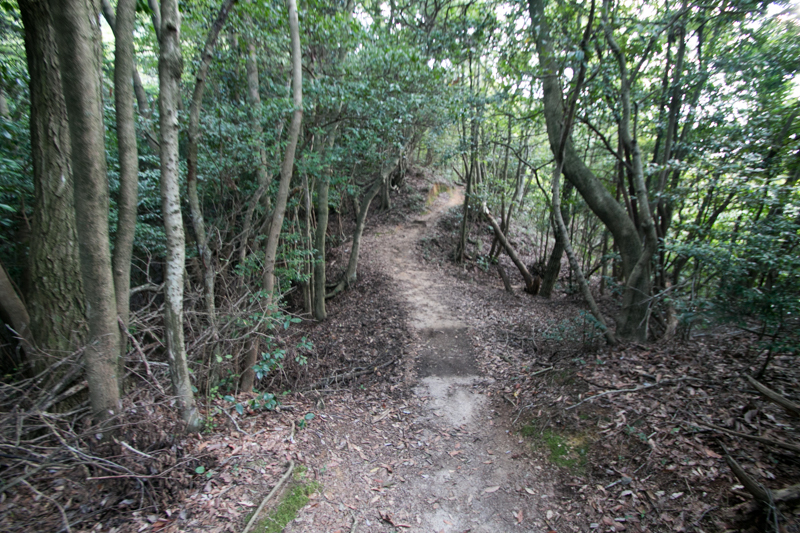 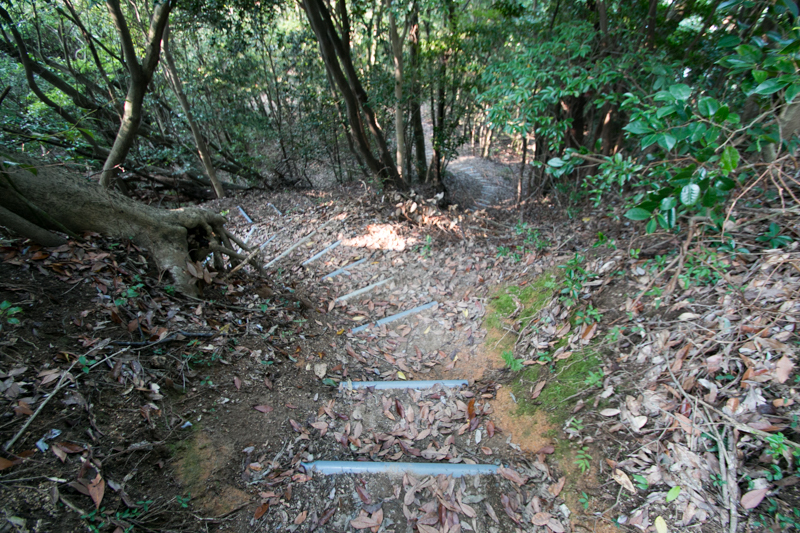 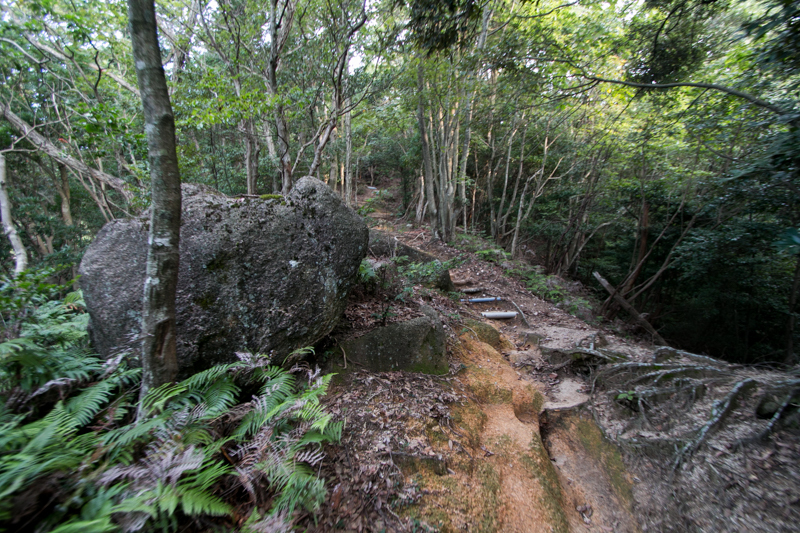 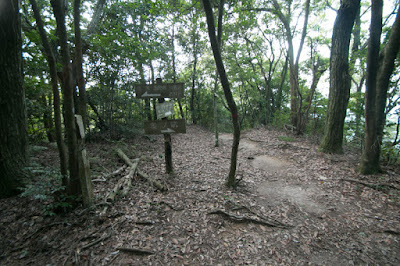 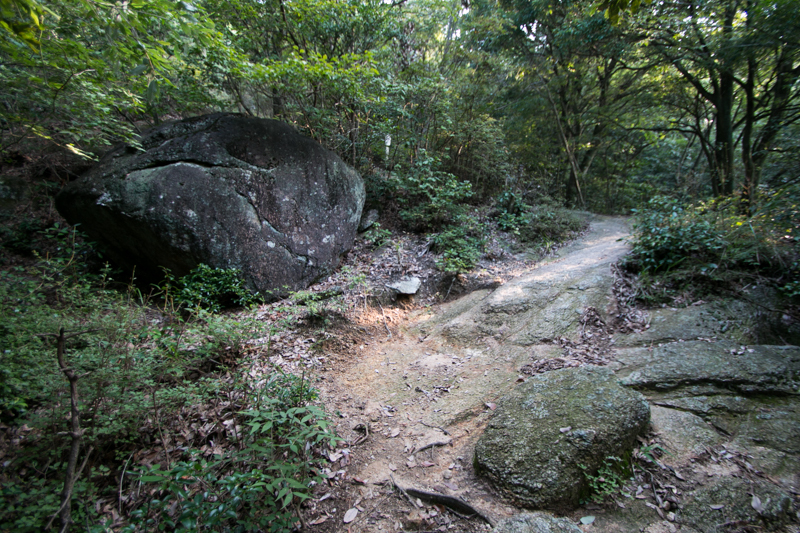 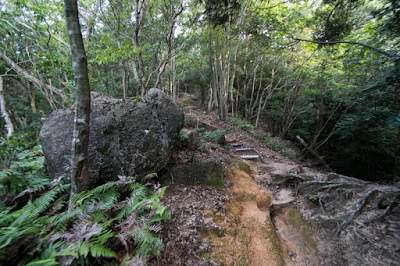 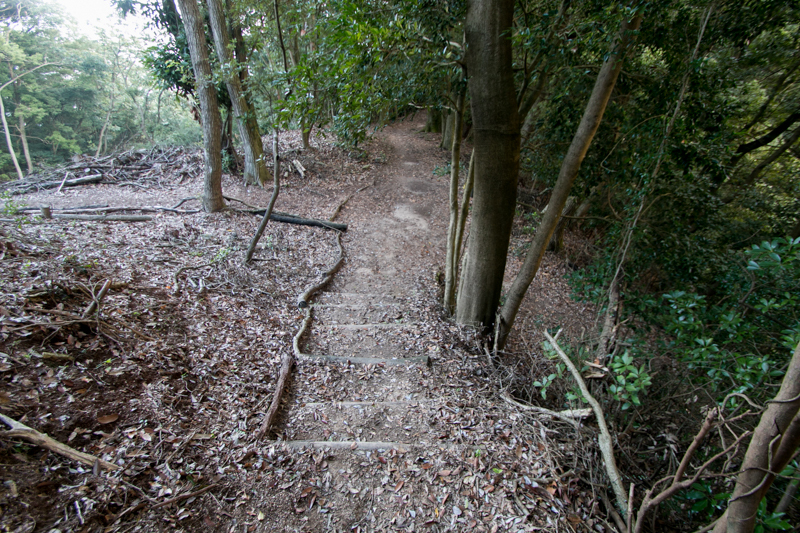 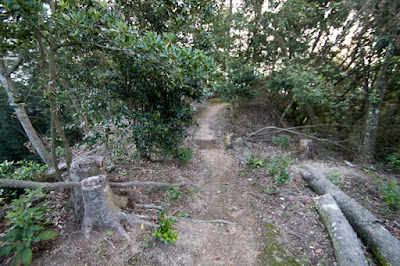 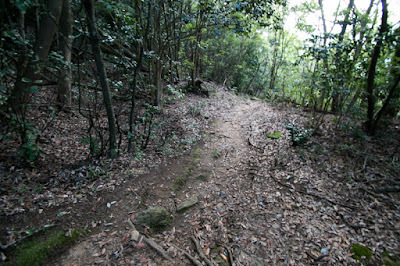 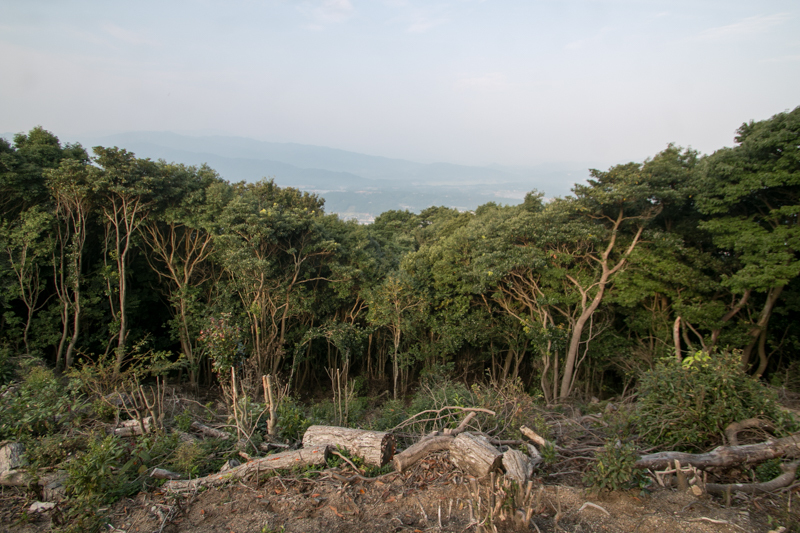 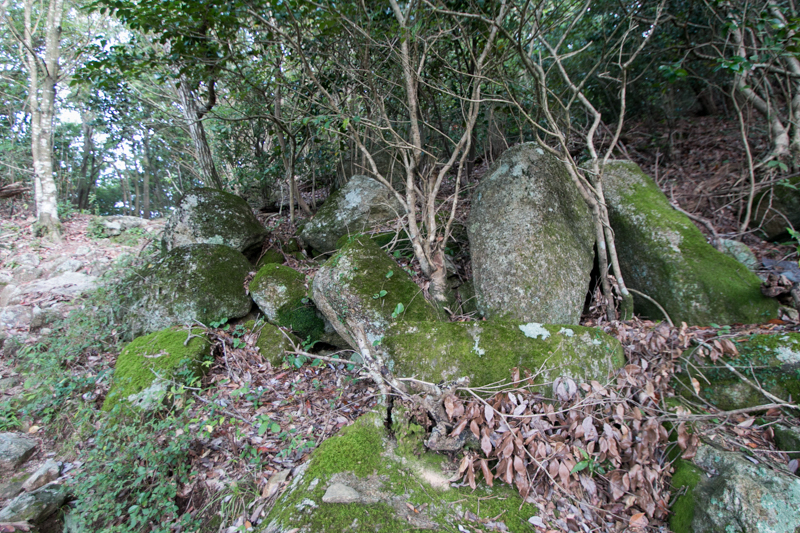 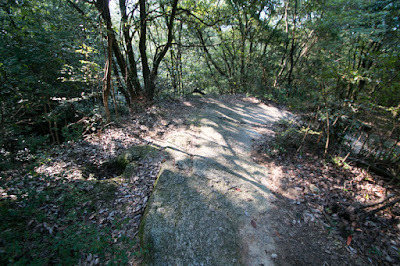 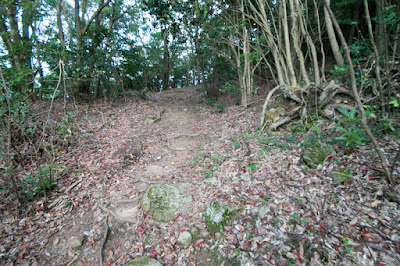 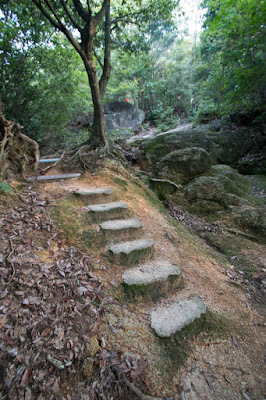 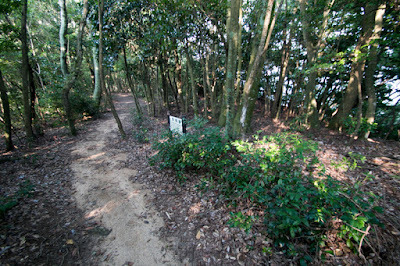 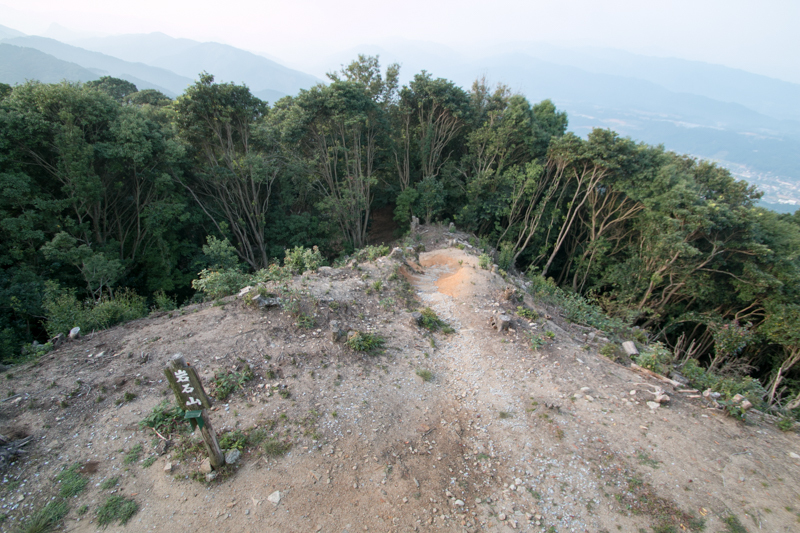 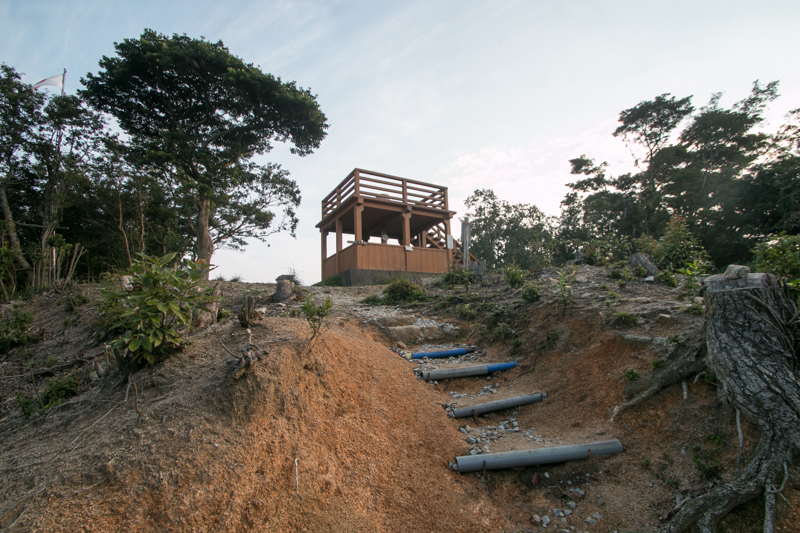 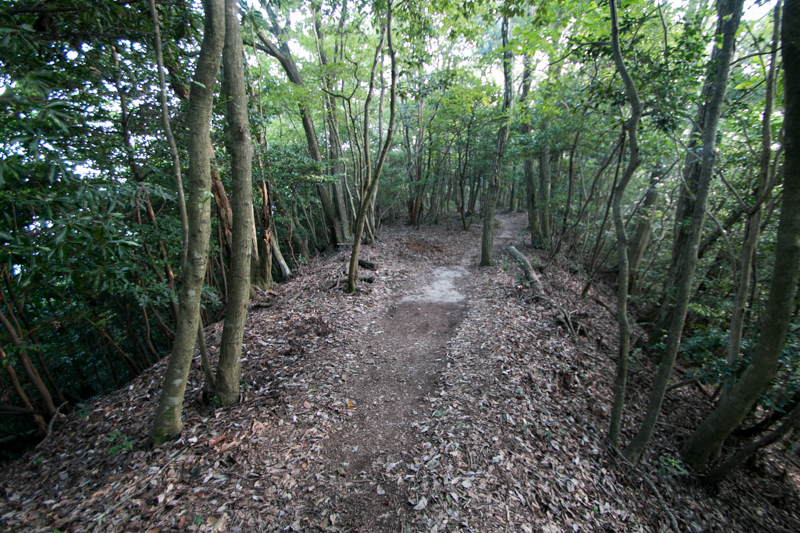 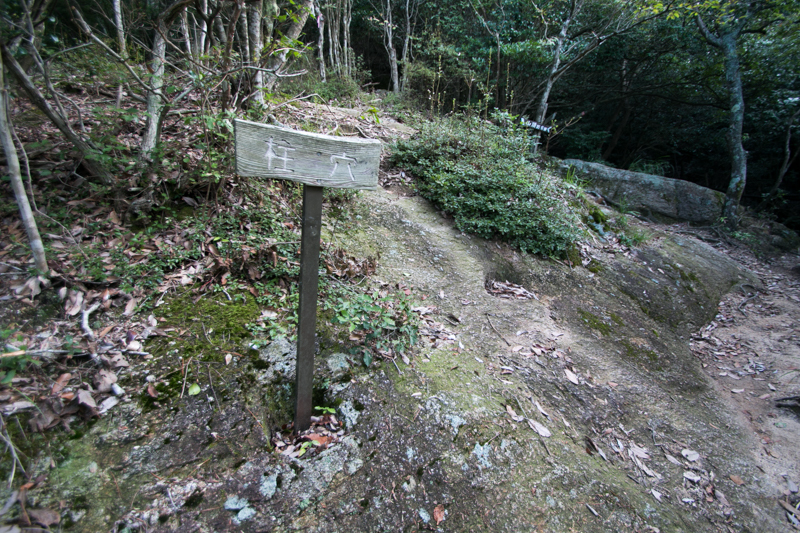 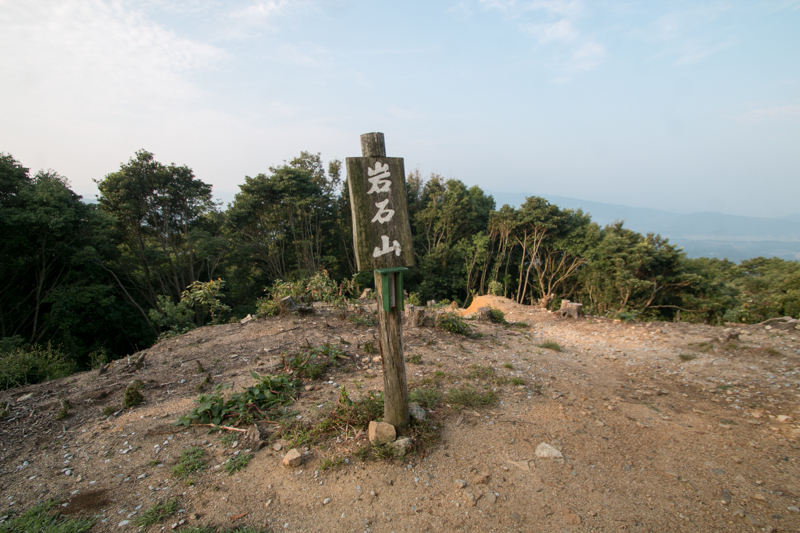 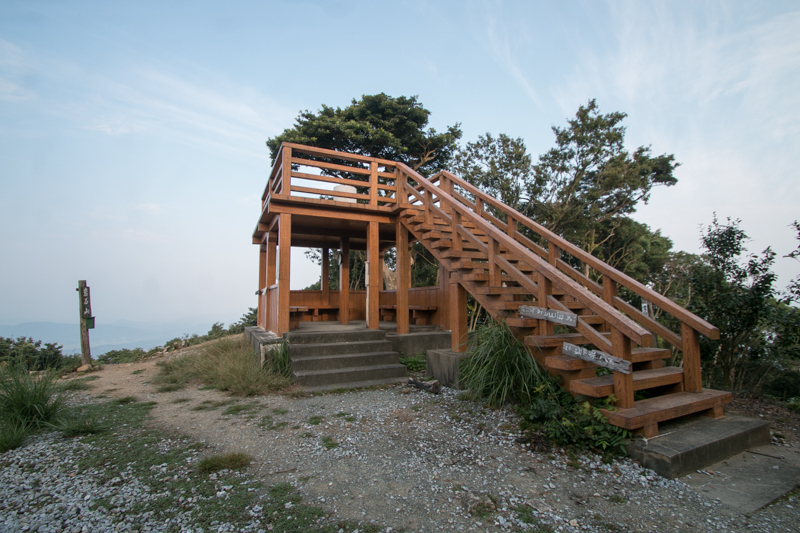 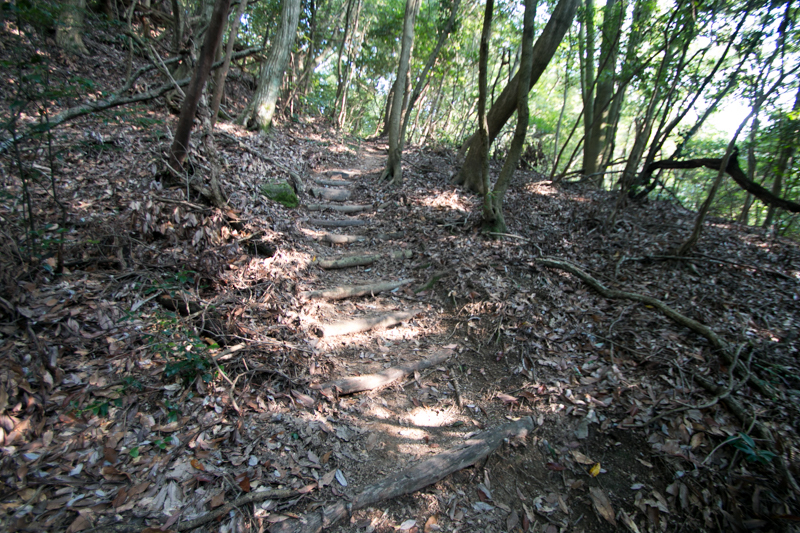 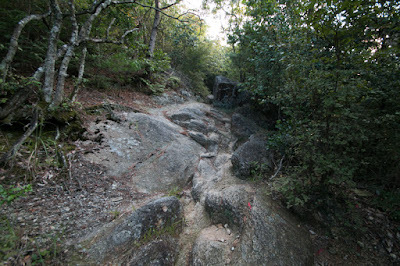 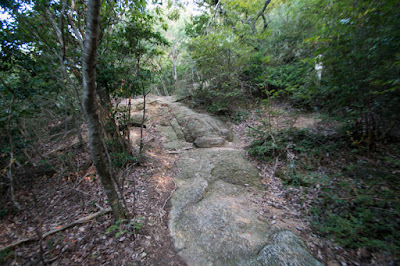 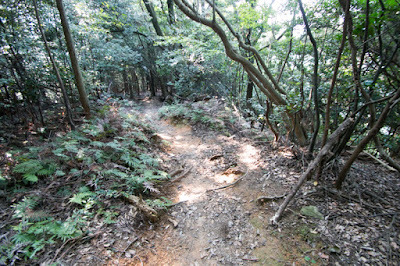 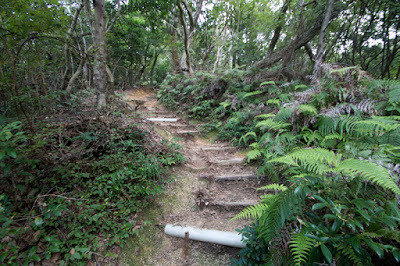 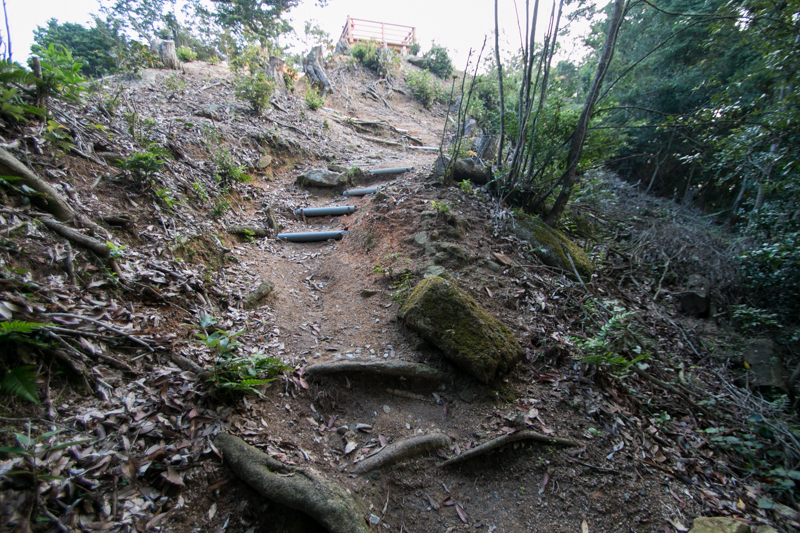 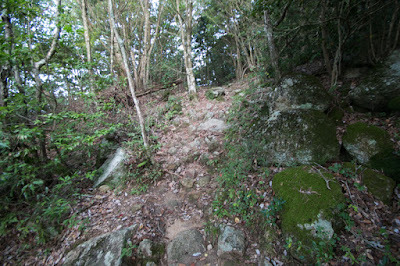 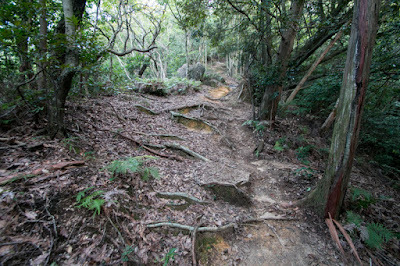 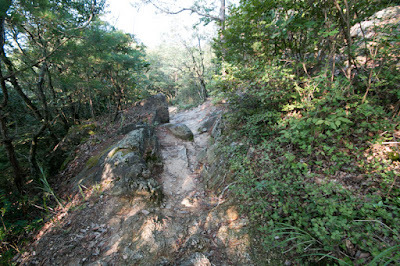 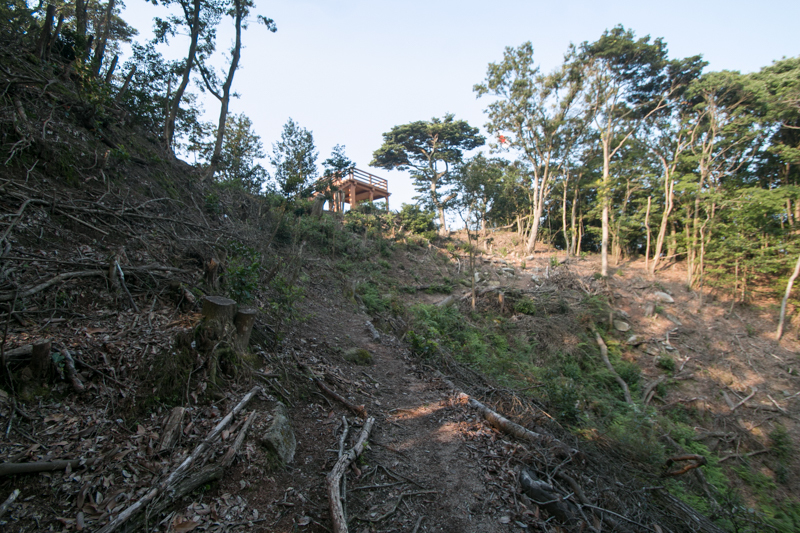 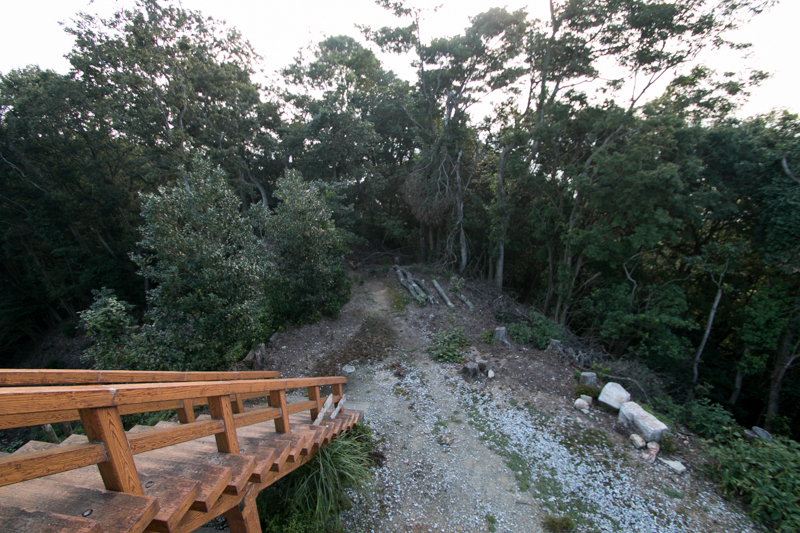 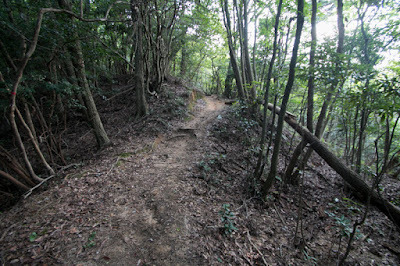 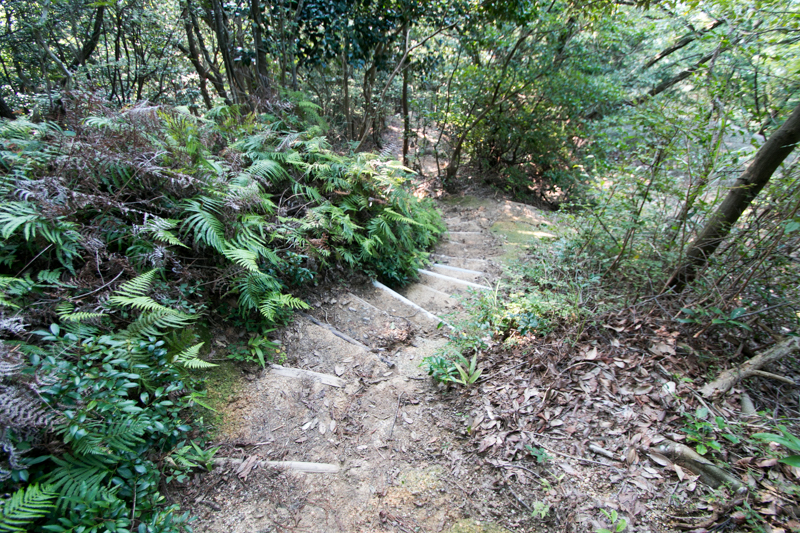 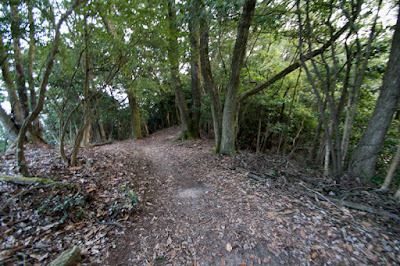 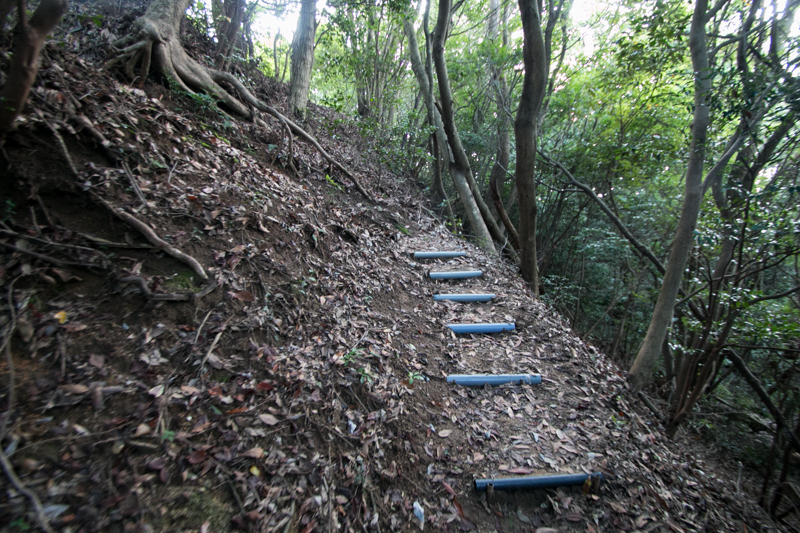 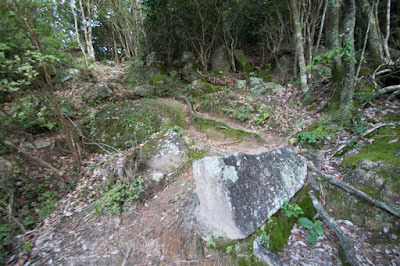 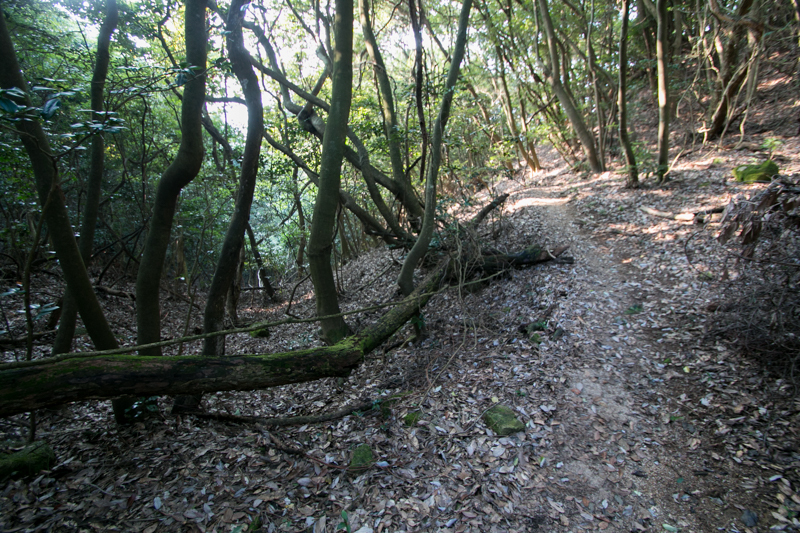 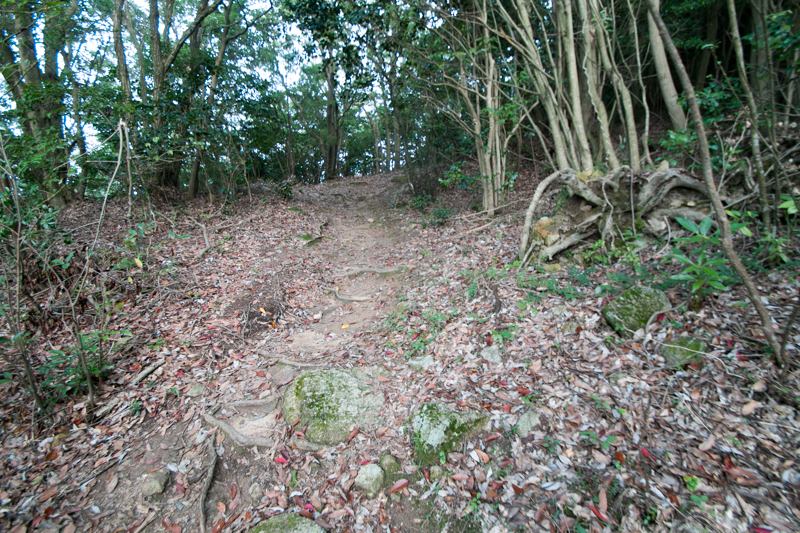 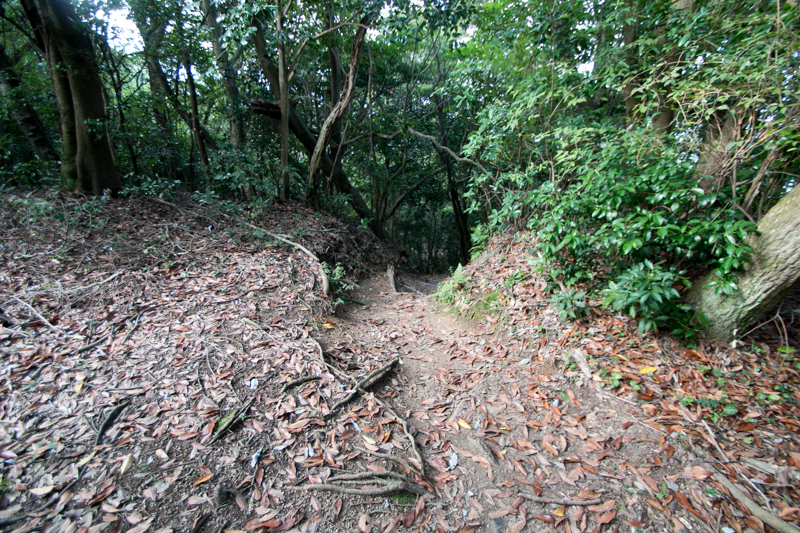 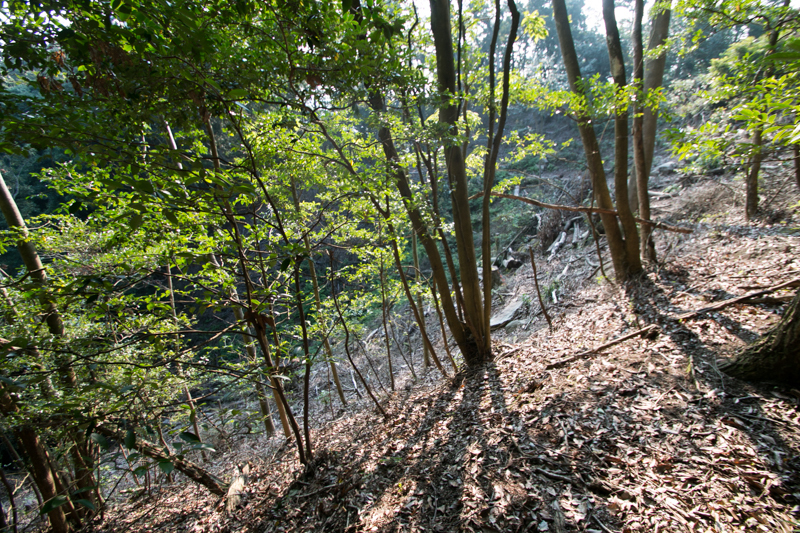 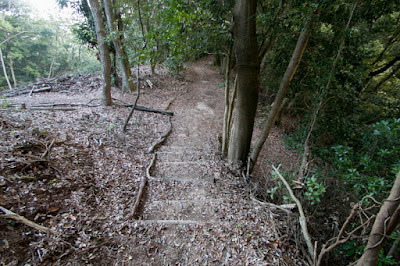 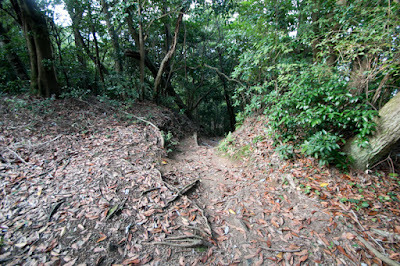 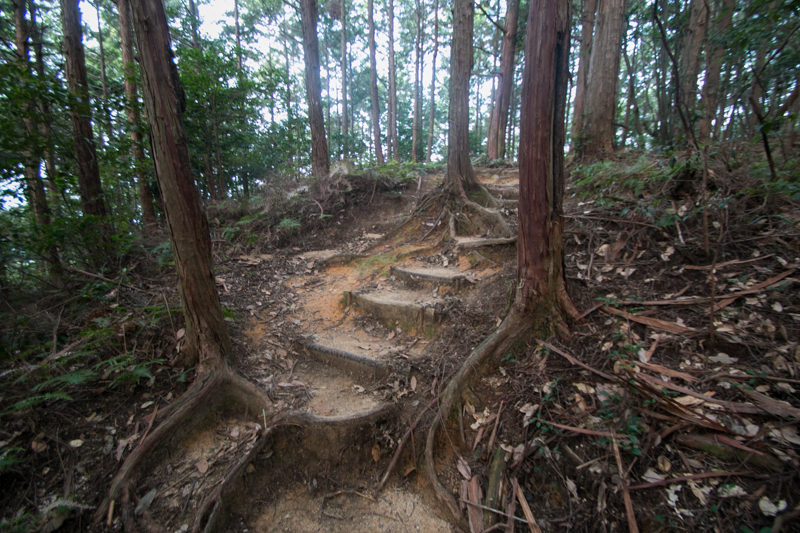 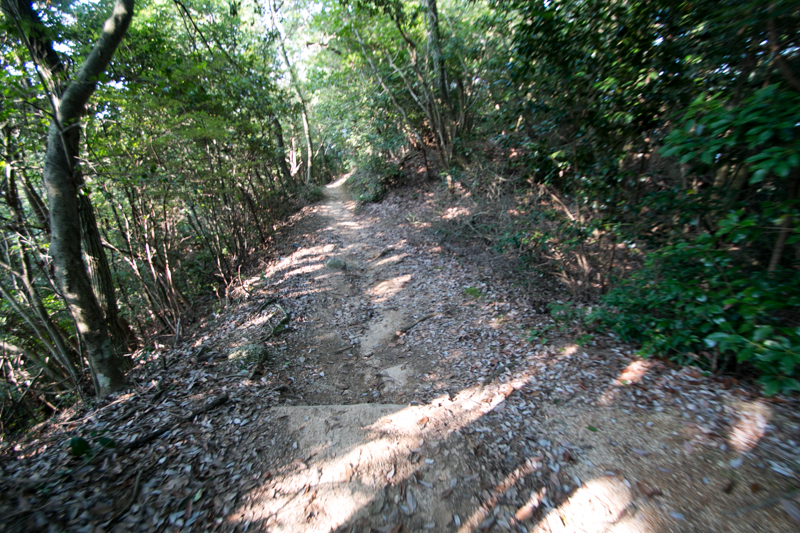 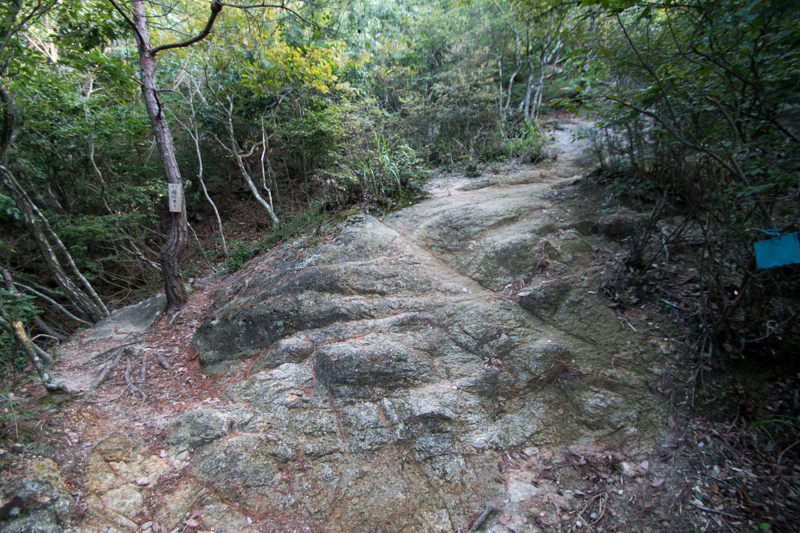 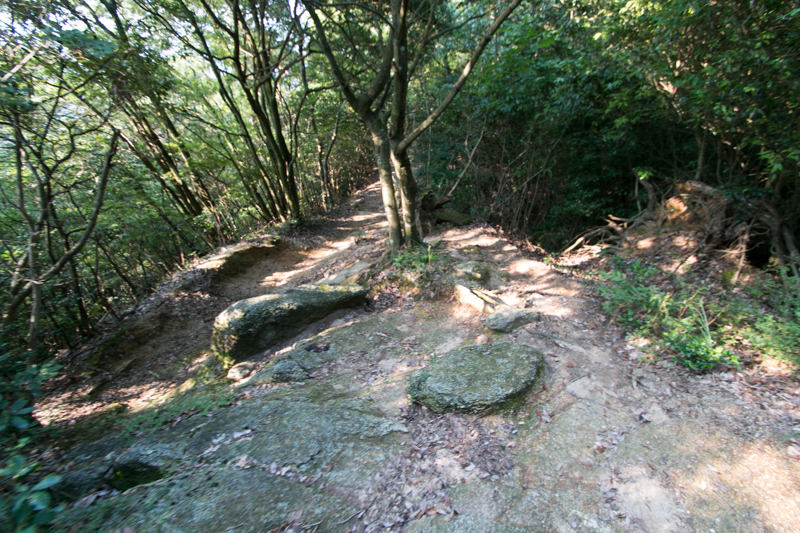 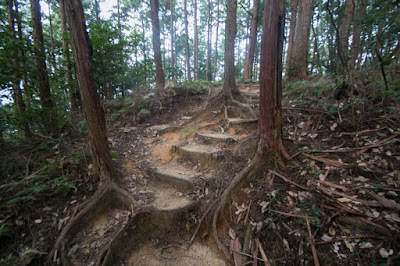 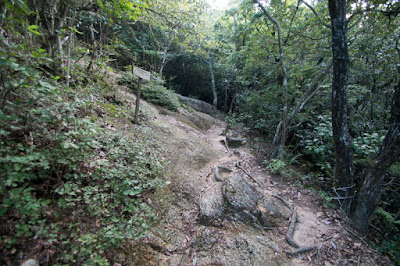 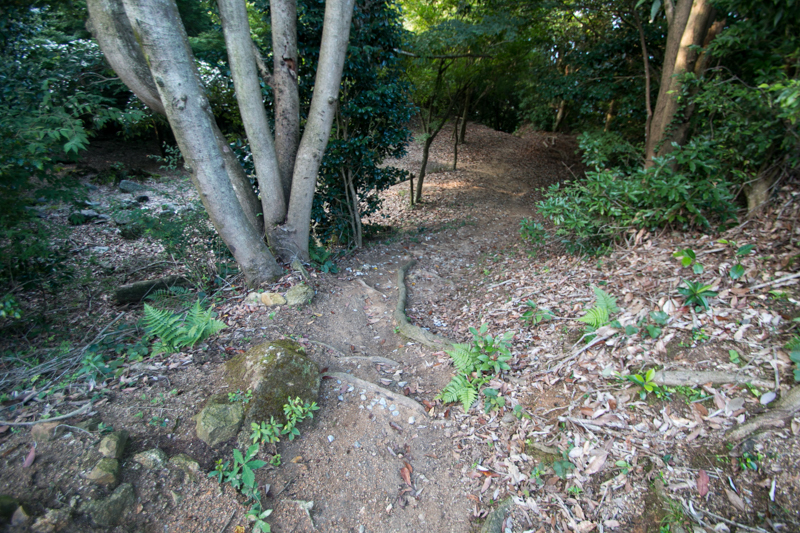 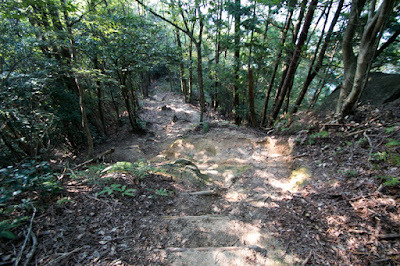 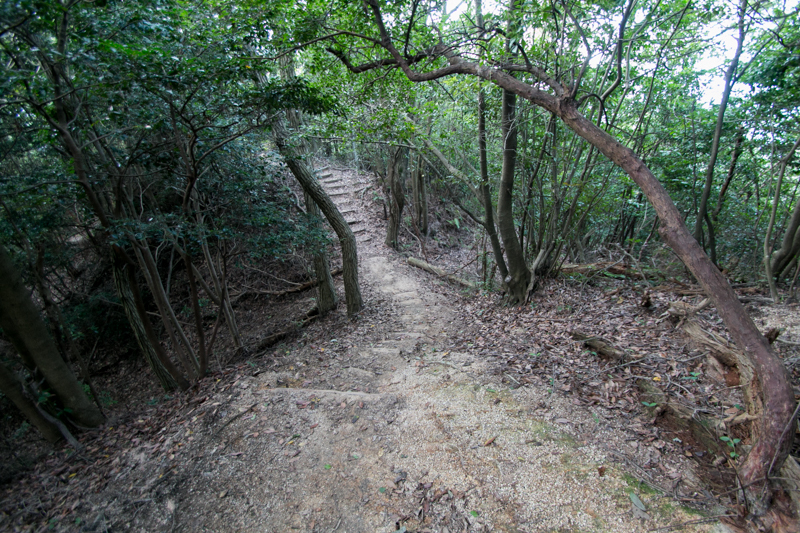 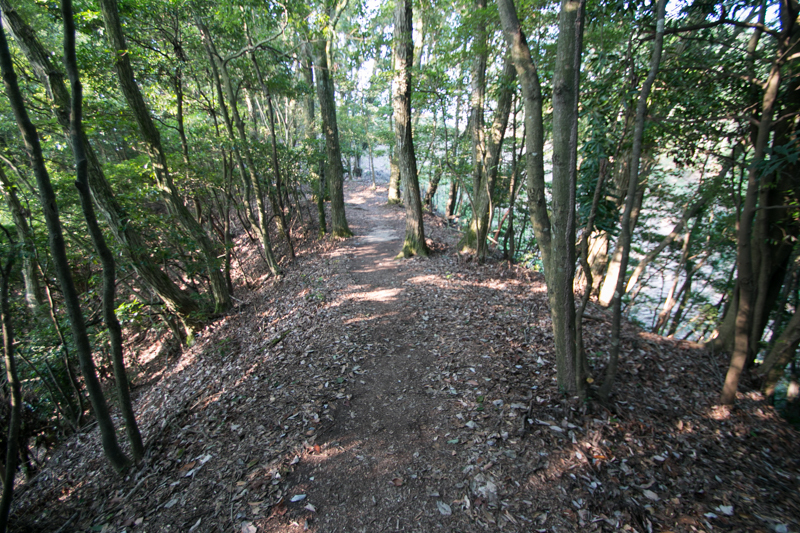 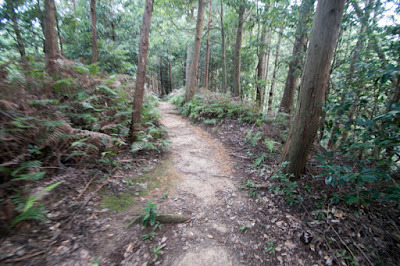 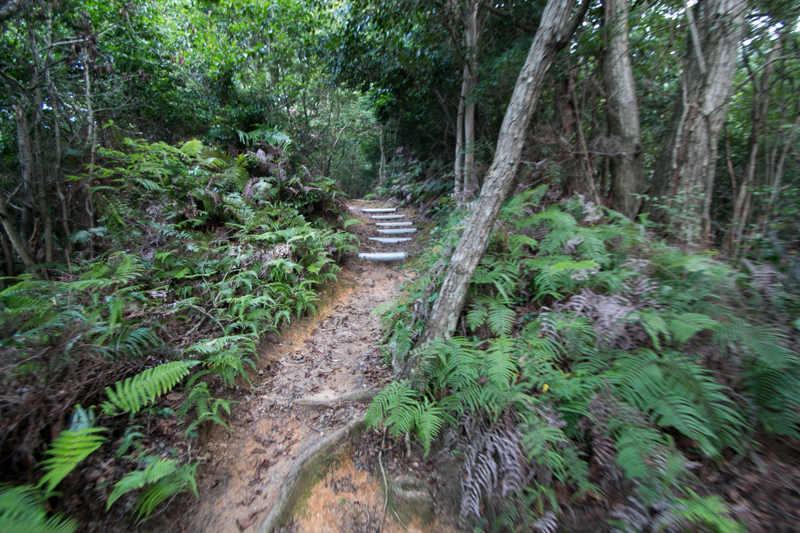 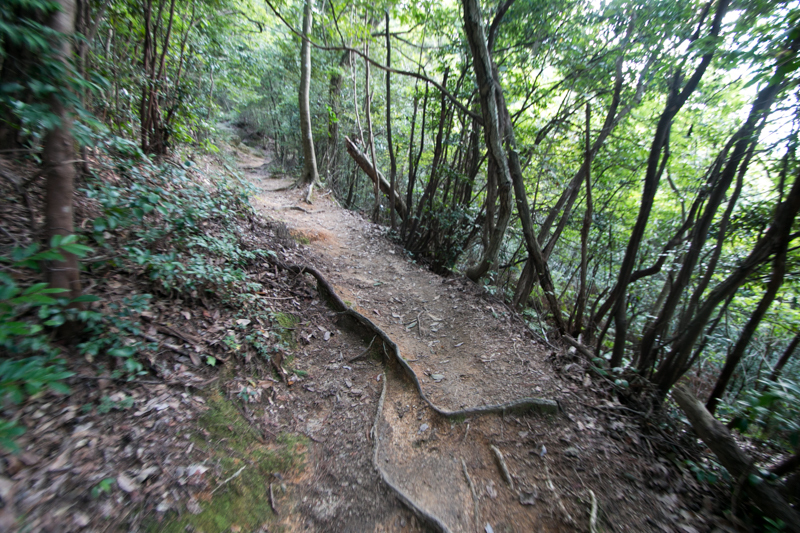 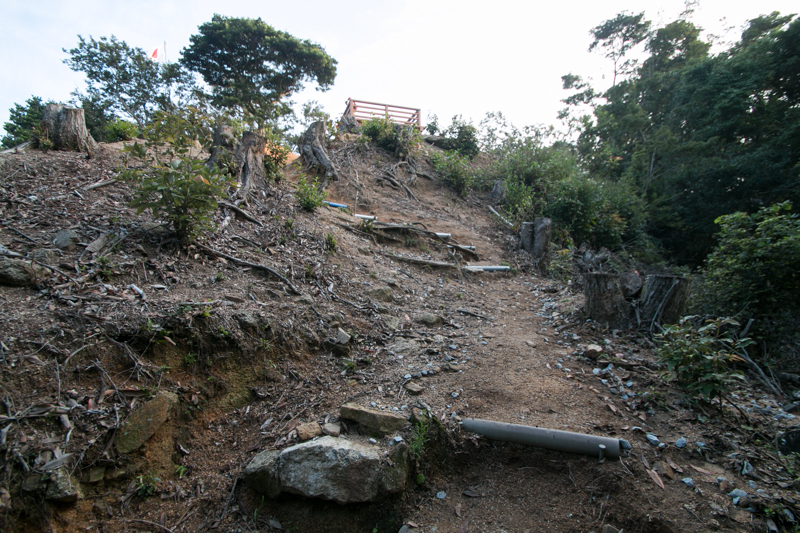 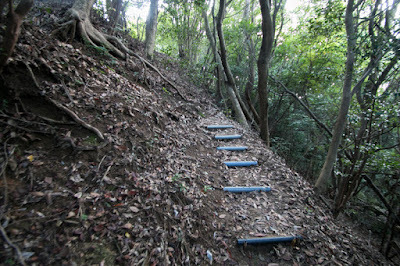 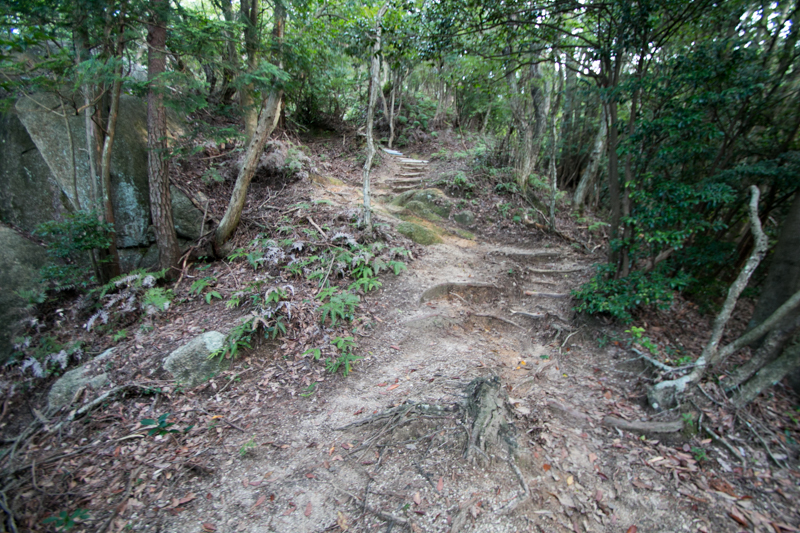 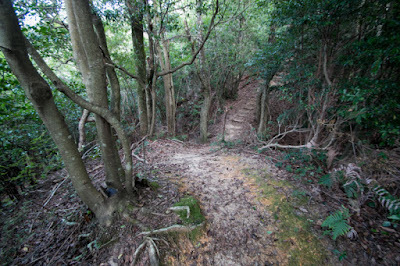 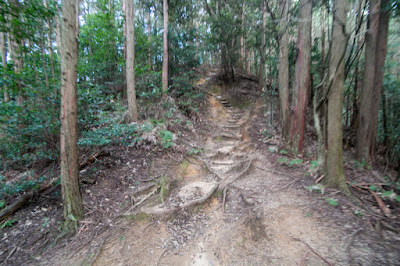 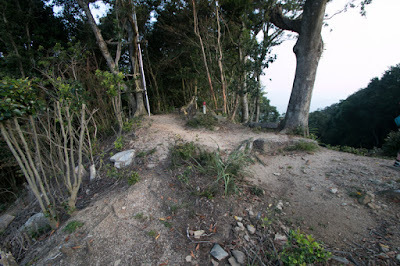 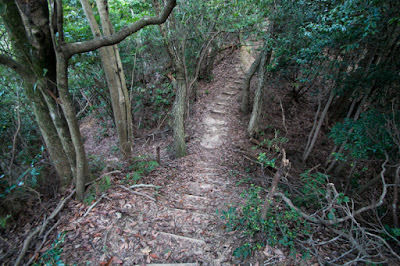 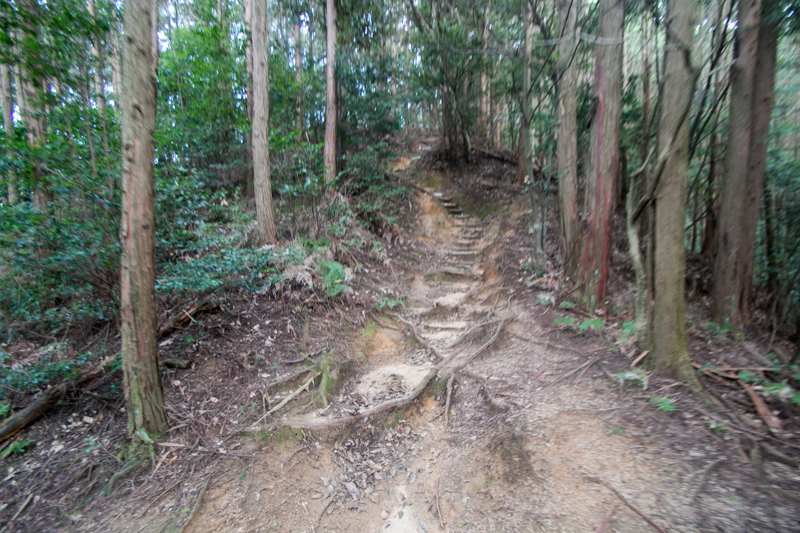 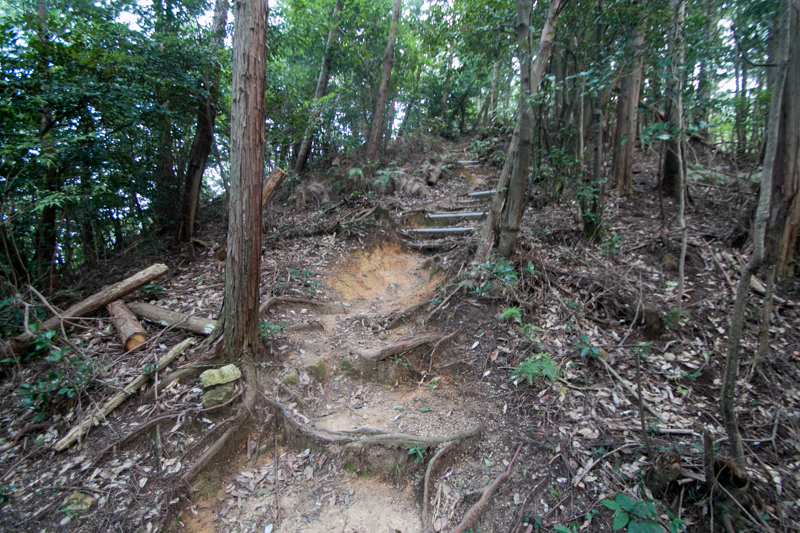 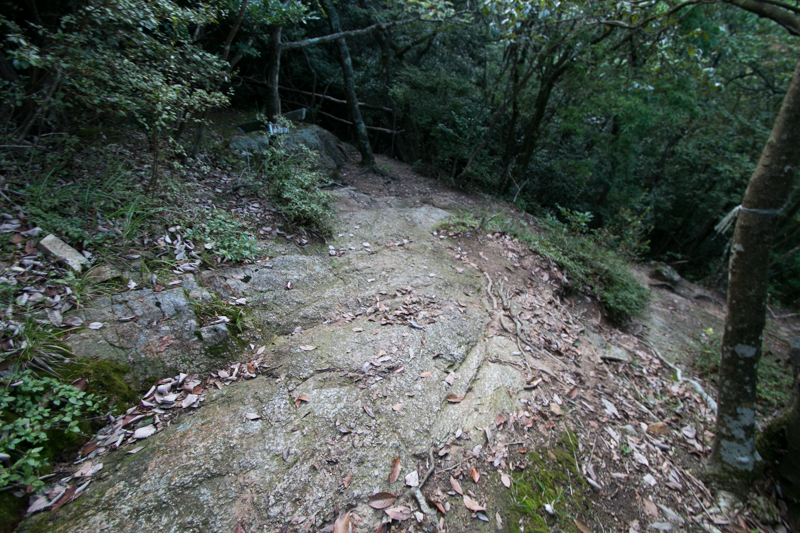 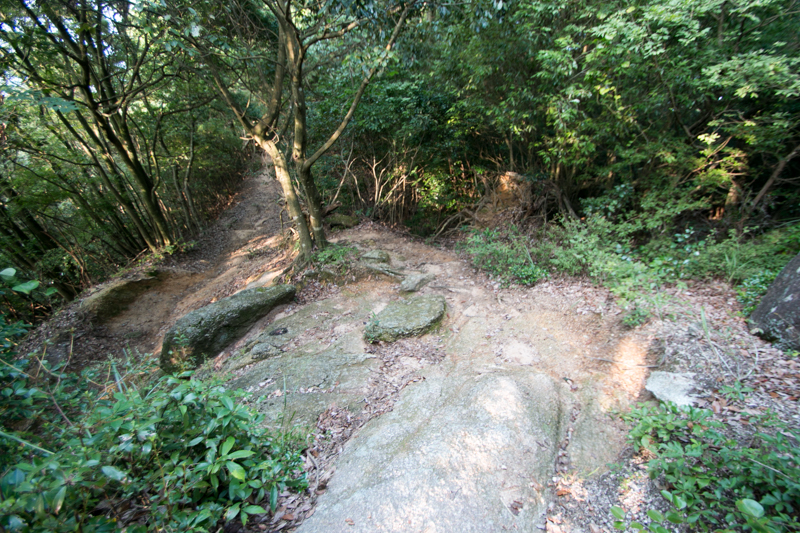 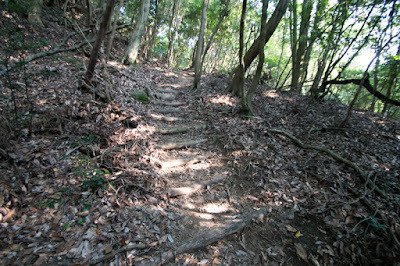 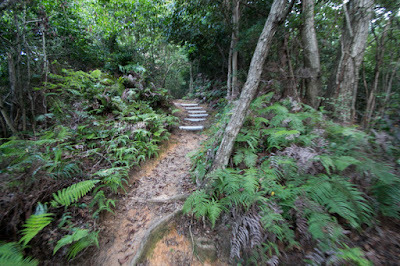 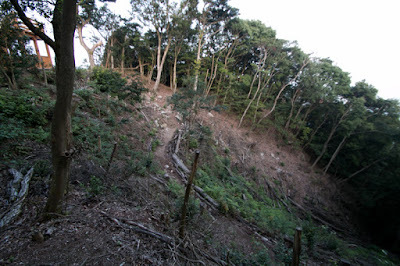 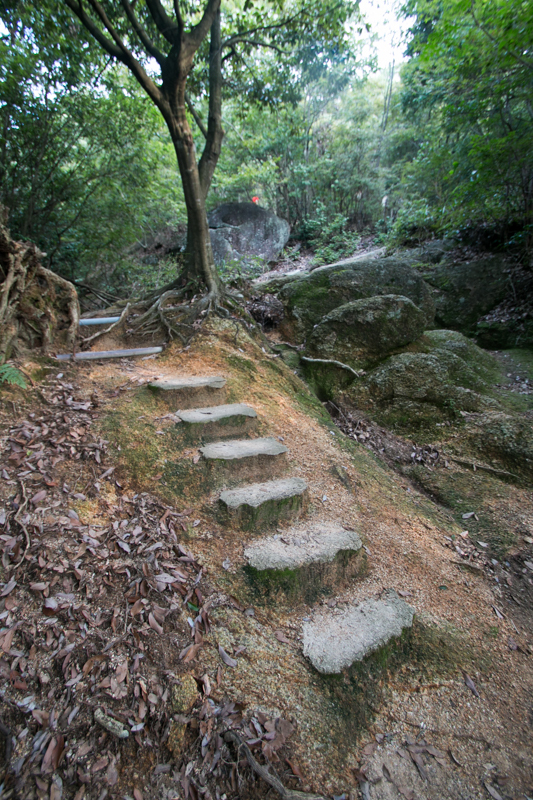 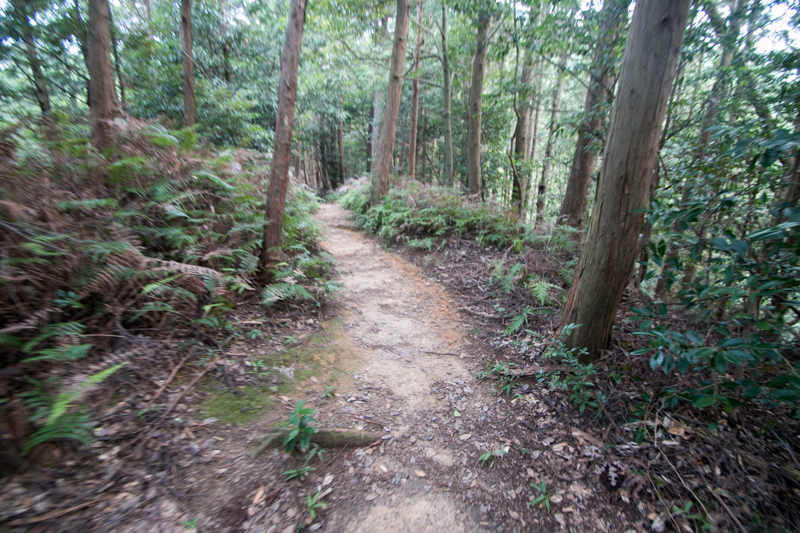 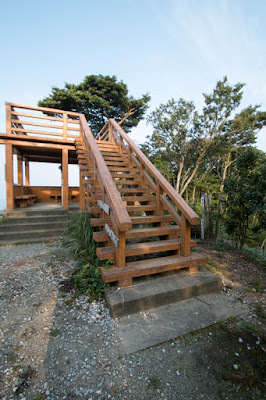 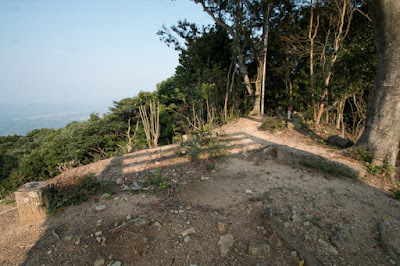 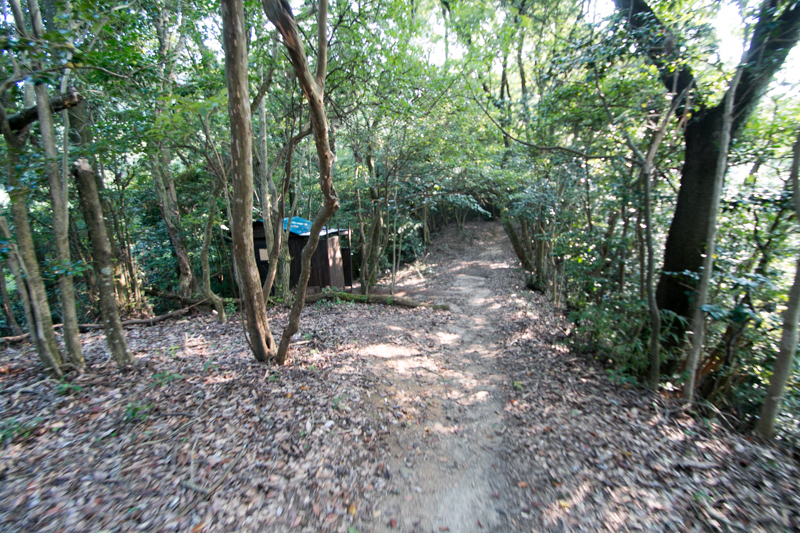 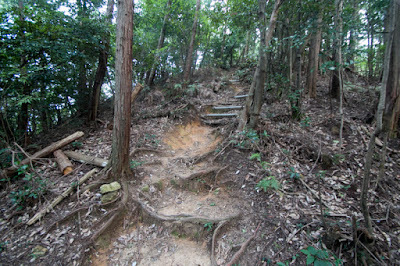 At the southwest of central area, there is another terrace called as Okunoin. 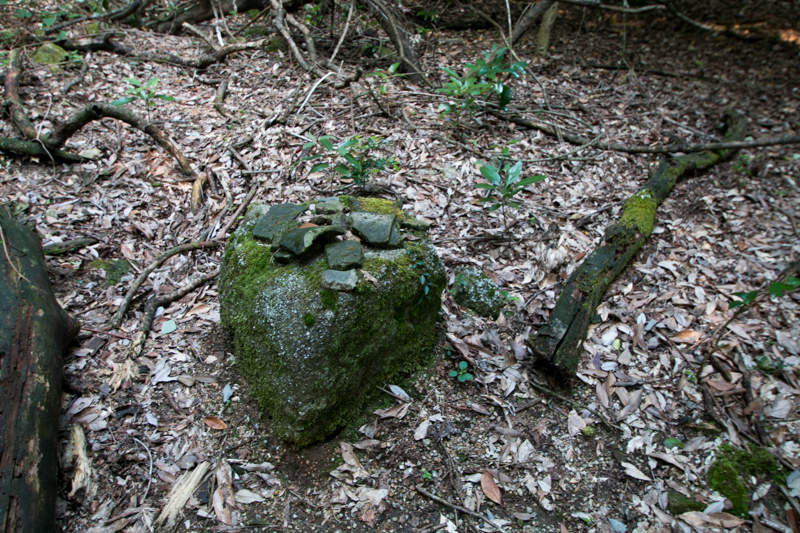 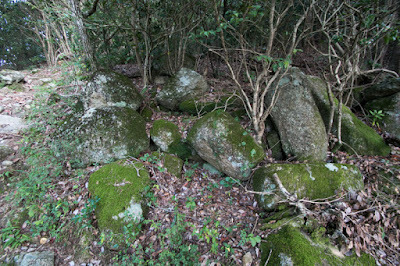 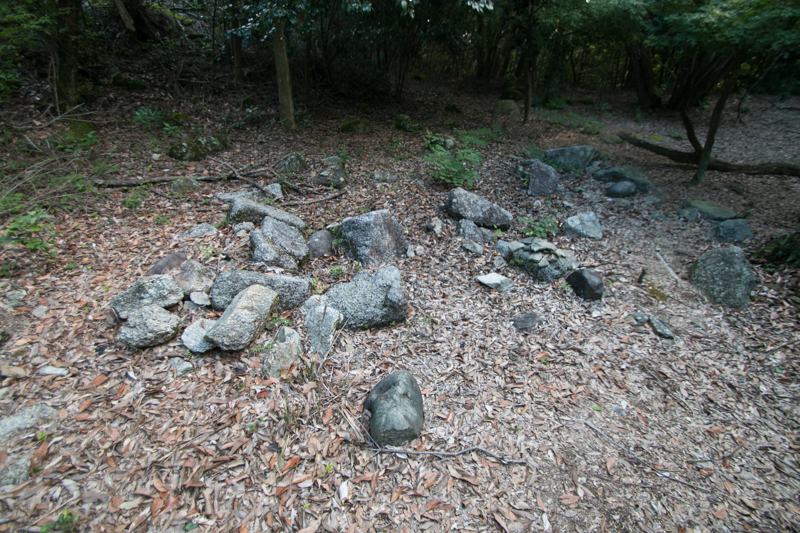 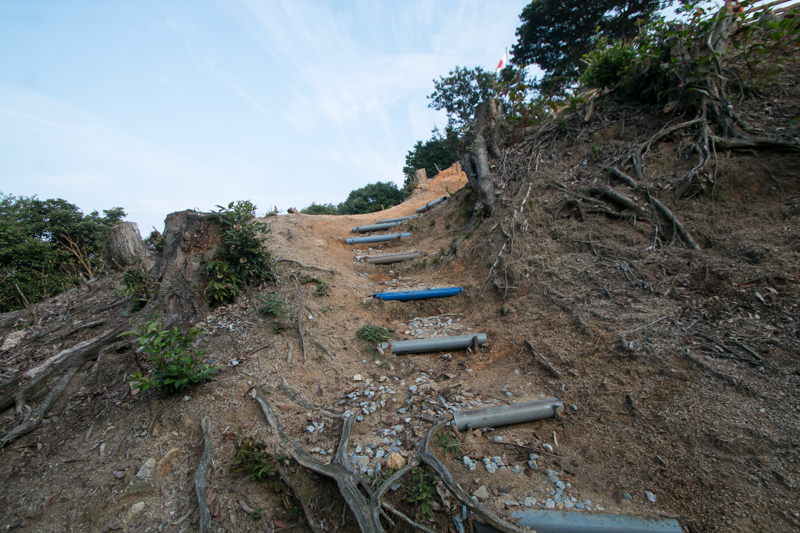 On the road between central area and Okunoin area there is a huge rock with artificially drilled holes, and this might be a ruin of gate. 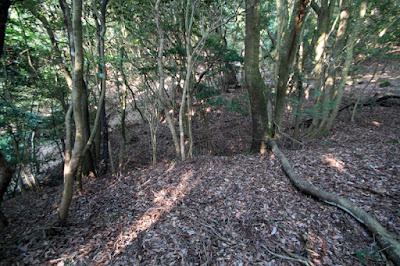 Total size of the castle is about 400 meter long and 150 meter wide and considerably large one at this area. 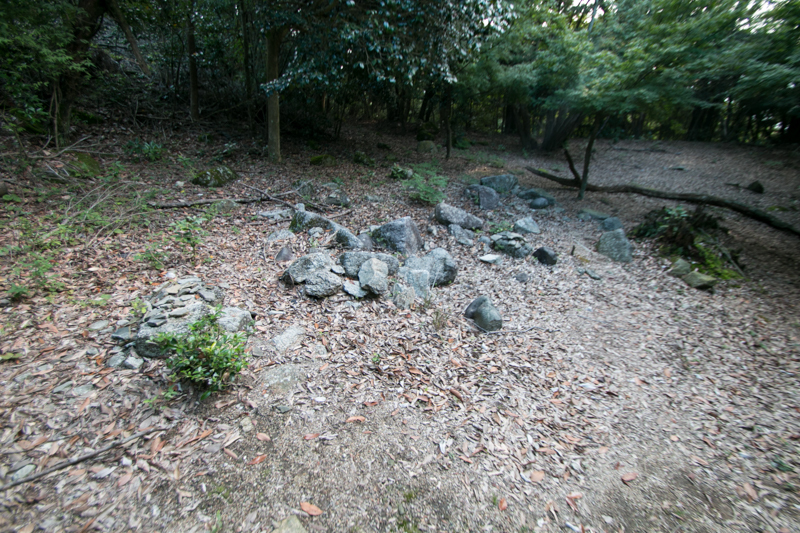 In 1586, Shimazu army made total attack against Otomo clan, and Otomo clan was forced to the corner, Tanezane attacked Iwaya castle protected by Jyoun Takahashi (1548-1586), a colleague of Dosetsu, along with Shimazu army. 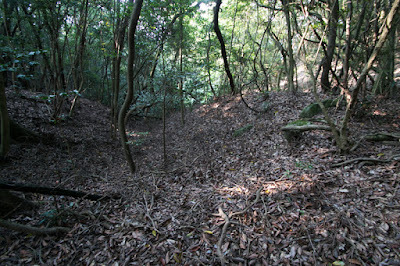 Shimazu army and Akizuki army fell Iwaya castle after a fierce battle, and capture of Hakata area was close at hand. 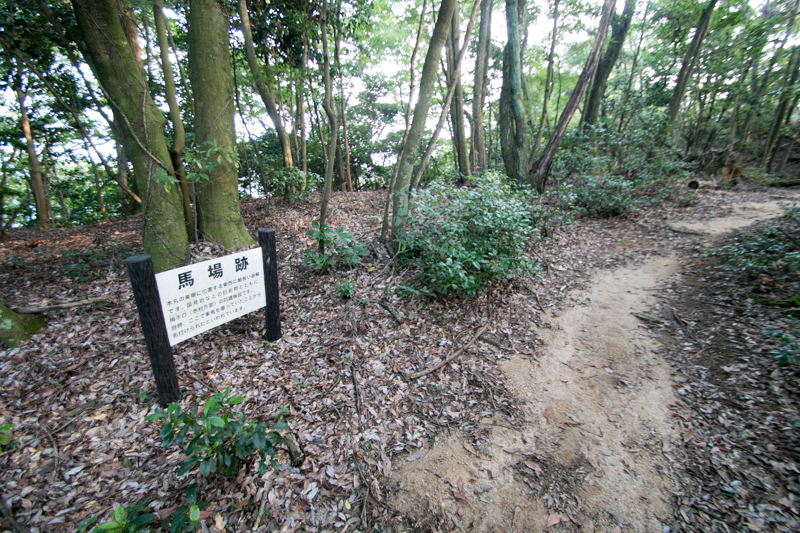 Next Shimazu army and Akizuki army siege Tachibanayama castle which was kept by Muneshige Tachibana (1567-1643), son of Jyoun and adopted son of Dosetsu. 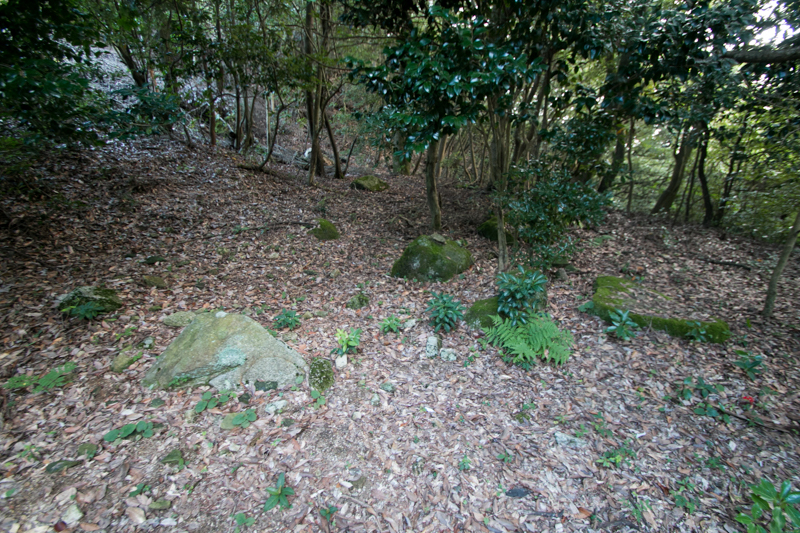 However, central ruler Hideyoshi Toyotomi (1537-1598) who was asked to rescue Otomo clan started Kyushu campaign against Shimazu clan. 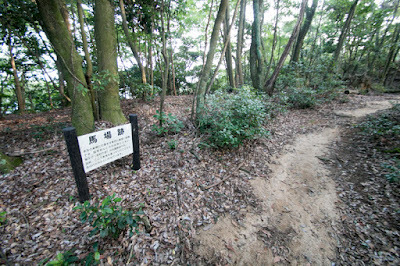 Vanguard of Toyotomi clan landed to Kyushu island, then Shimazu army released siege of Tachibanayama castle and retreated. 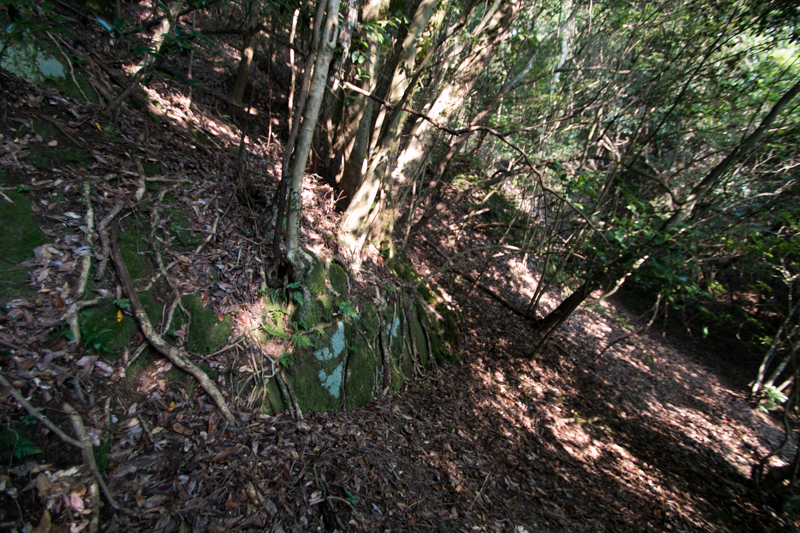 Akizuki army was defeated by counter attack of Muneshige, and in turn Akizuki clan was exposed to strong enemy. In 1587, at last main force of Hideyoshi with 200,000 soldier landed to Kyushu island., and many local lords at north part of Kyushu island turned to Hideyoshi. 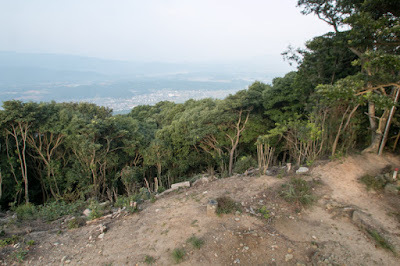 As detached force lead by Hidenaga Toyotomi (1540-1591) already released Bungo province and intruded into Hyuga province (Miyazaki prefecture), Hideyoshi planned to proceed to Higo province through current Kurume area with his main force. 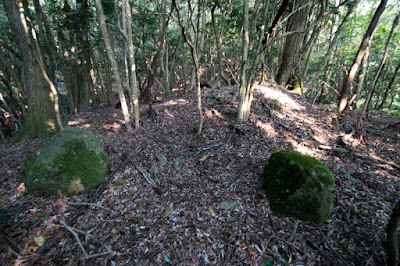 Akizuki clan and Ganjaku castle became the first target of Hideyoshi. 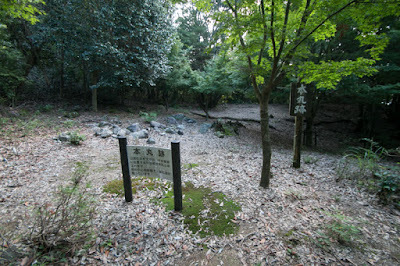 Hideyoshi recommended Tanezane Akizuki to surrender, but Tanezane refused this recommendation and prepared for resistance. Tanezane himself stayed at Masutomi castle (Fukuoka prefecture) at the center of his territory, and placed 3,000 soldier at Ganjaku castle. 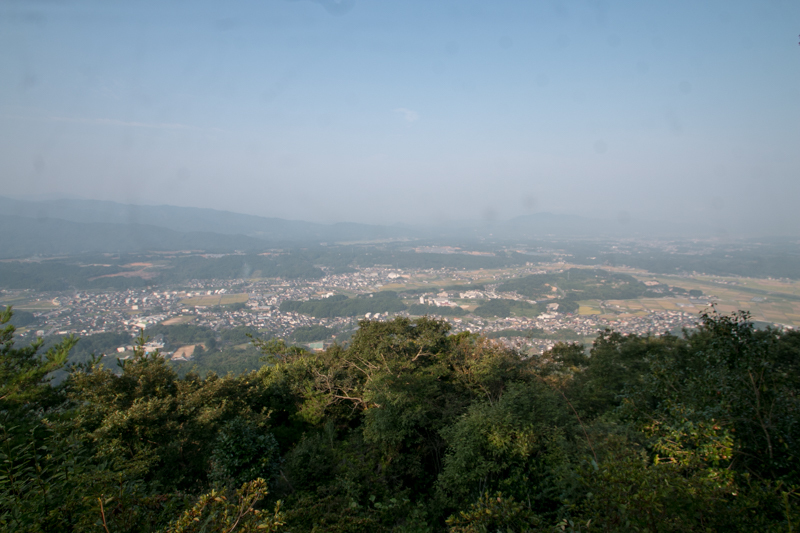 To show his power to surrounding lords and Shimazu clan and urge enemies to surrender, Hideyoshi decided to make a force attack to Ganjaku castle. 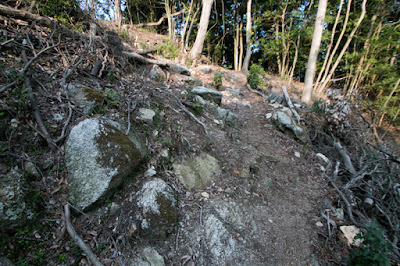 This was a typical tactics of Hideyoshi, also seen in his campaign against Saika area, Shikoku island and Hojo clan. On April 1, 1587, Hideyoshi ordered his army lead by his nephew Hidekatsu Hashiba (1569-1592), Ujisato Gamo (1556-1595) and Toshinaga Maeda (1562-1614) to siege Ganjaku castle. 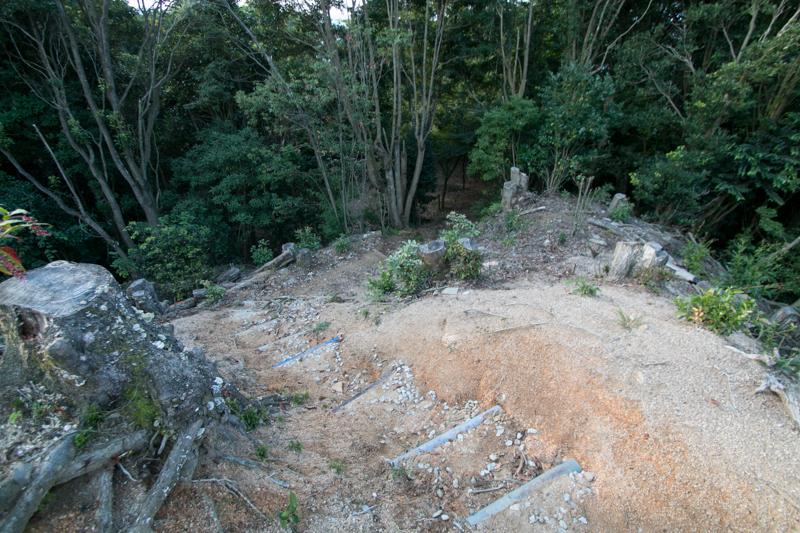 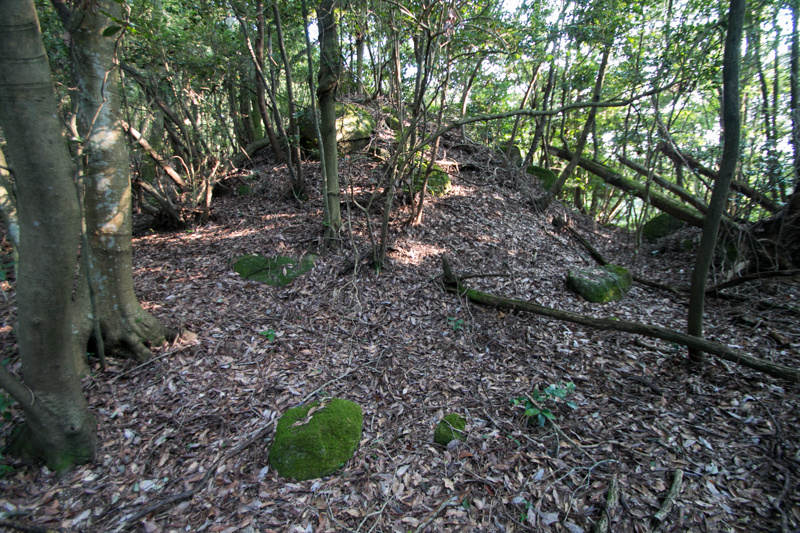 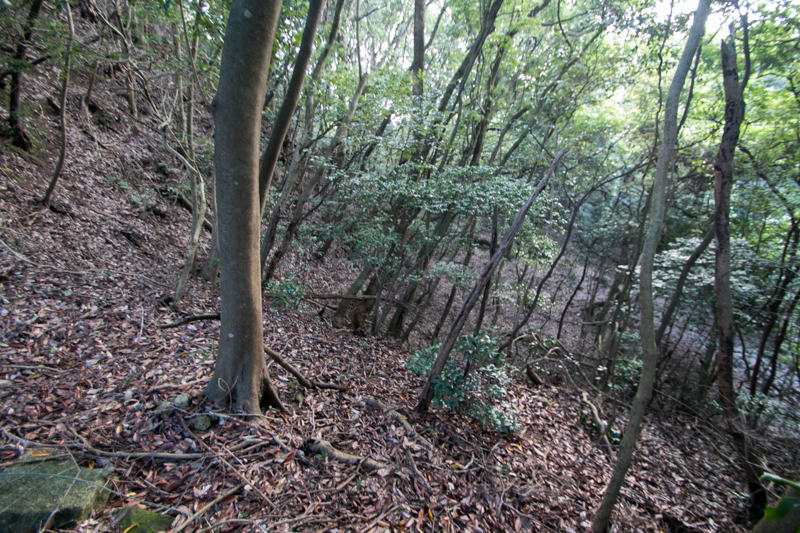 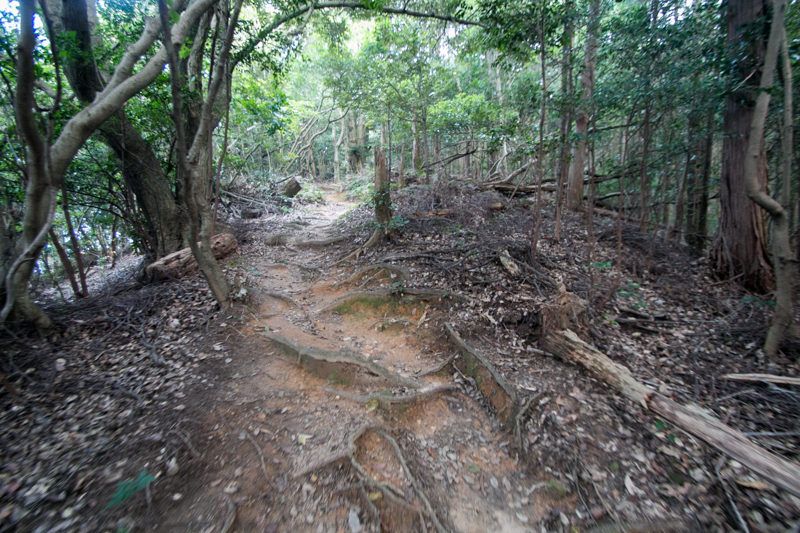 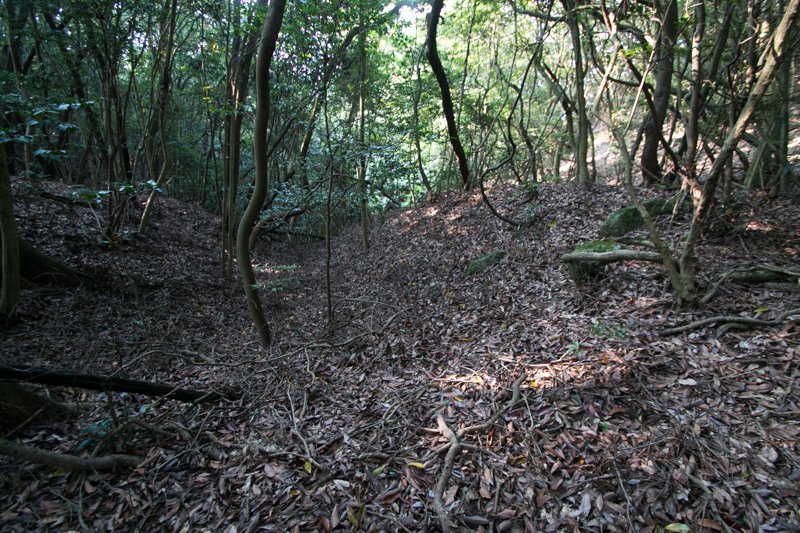 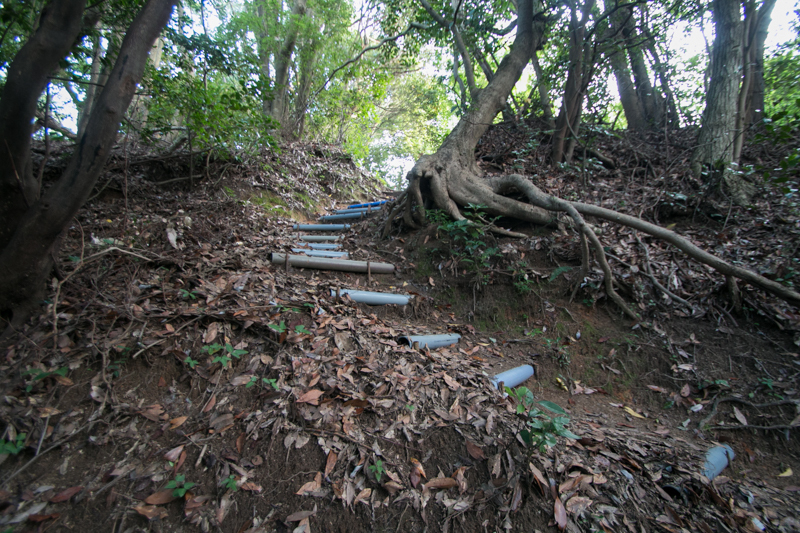 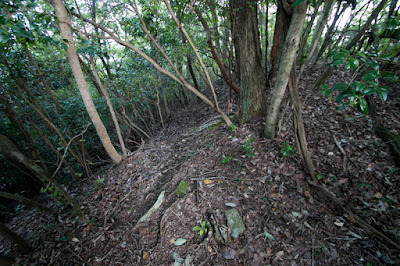 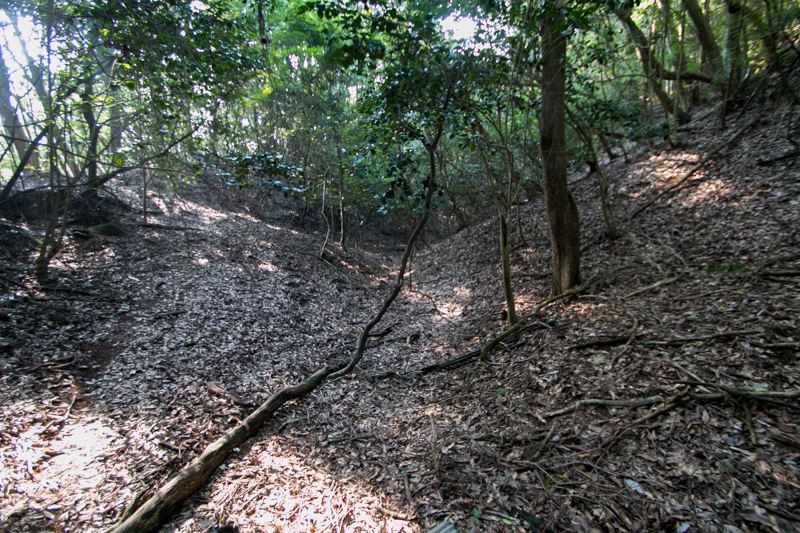 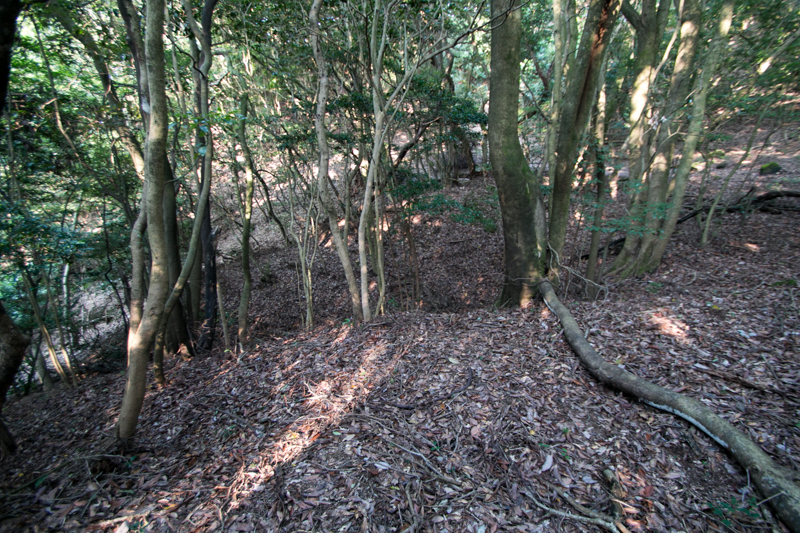 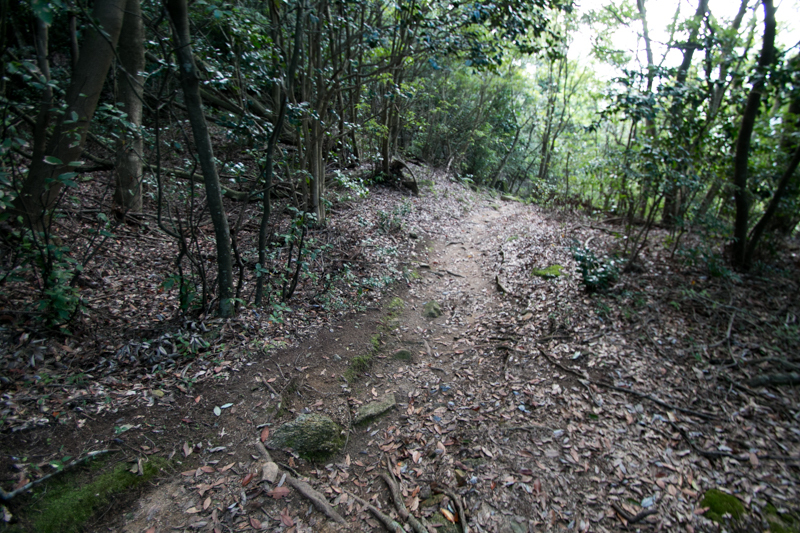 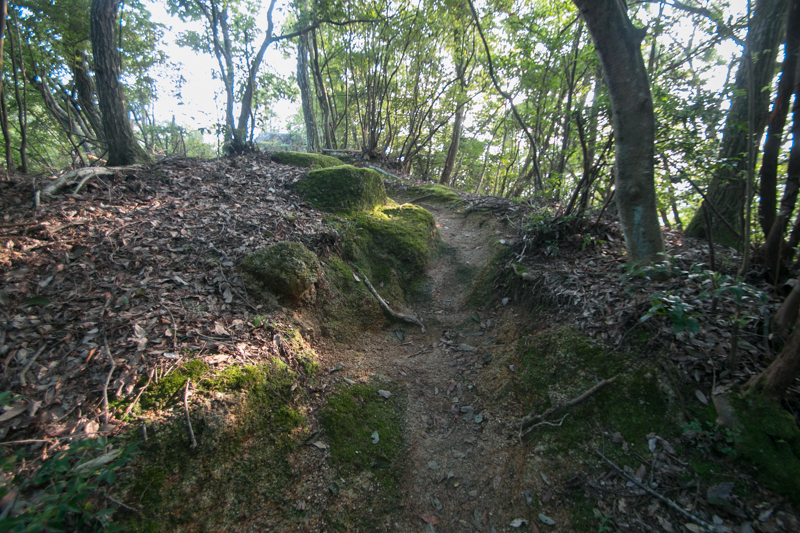 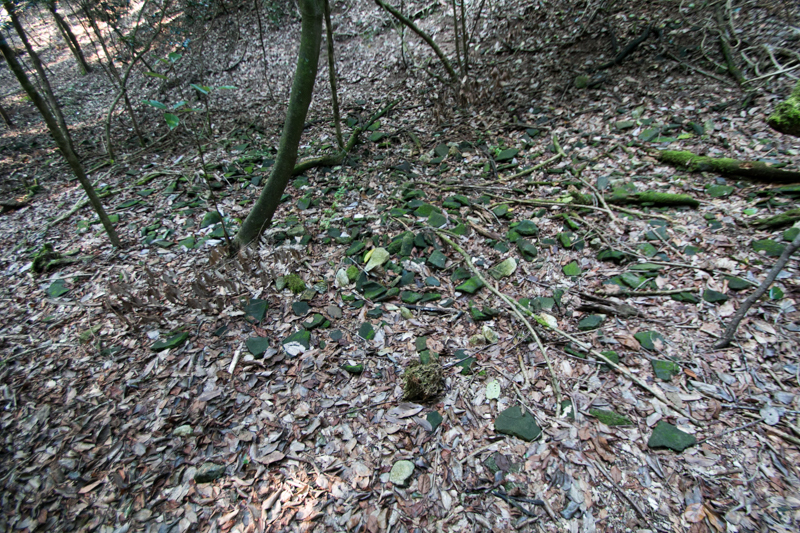 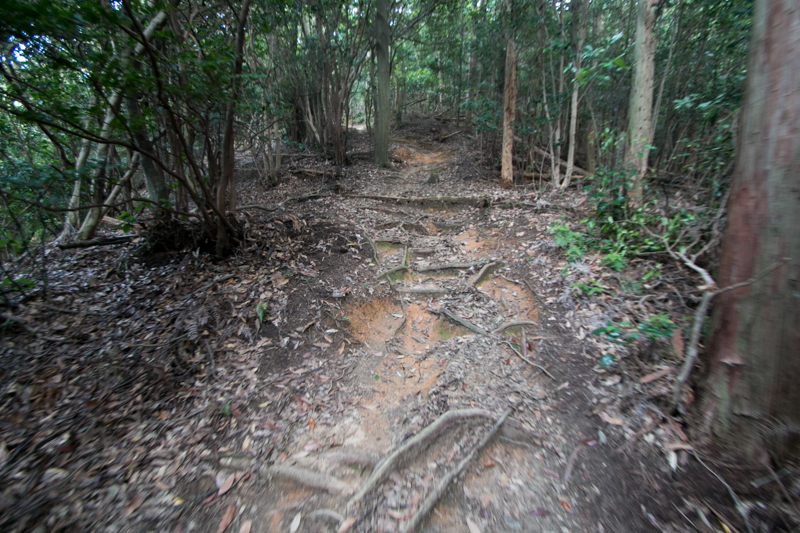 Akizuki army desperately fought, but being overwhelmed by thousands of enemy, Ganjaku castle fell only in one day. 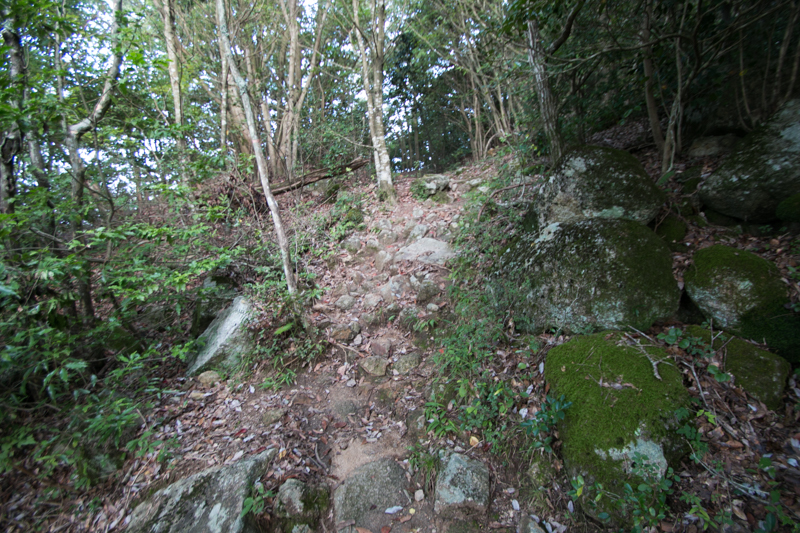 In spite of its highness, there are many climbing route to the castle and the castle could not bear saturation attack from many directions. Tanezane Akizuki knew the fall of Ganjaku castle only in one day disposed Masutomi castle and retreated to his main base Koshosan castle at incredibly higher place as a main base of large lord. 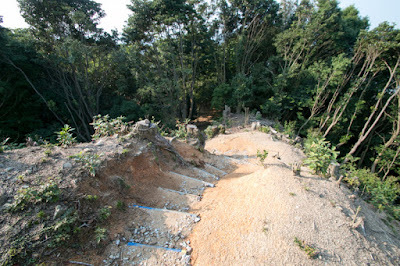 But next day Hideyoshi advanced to destructed Masutomi castle and made paper mache building to pretend to reconstruct the castle only in one day. 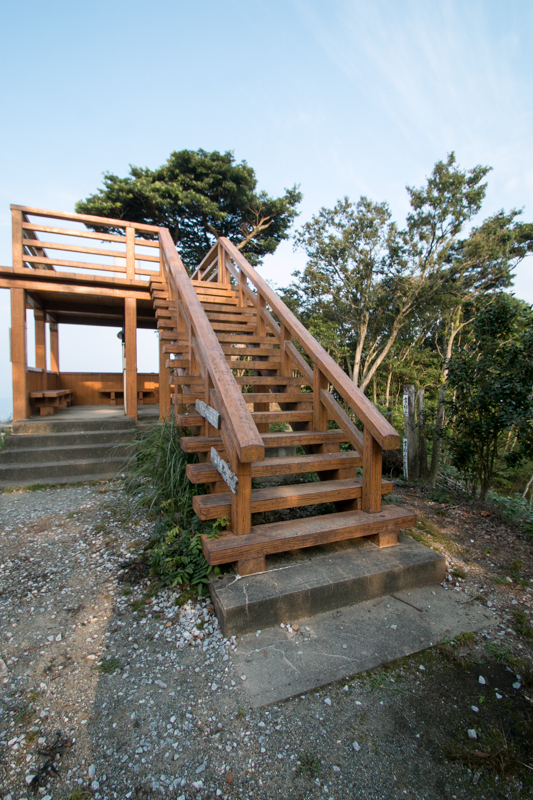 Looking at this one day fall and one day build, Tanezane Akizuki lost his will and surrendered to Hideyoshi, by giving his treasured tea were. 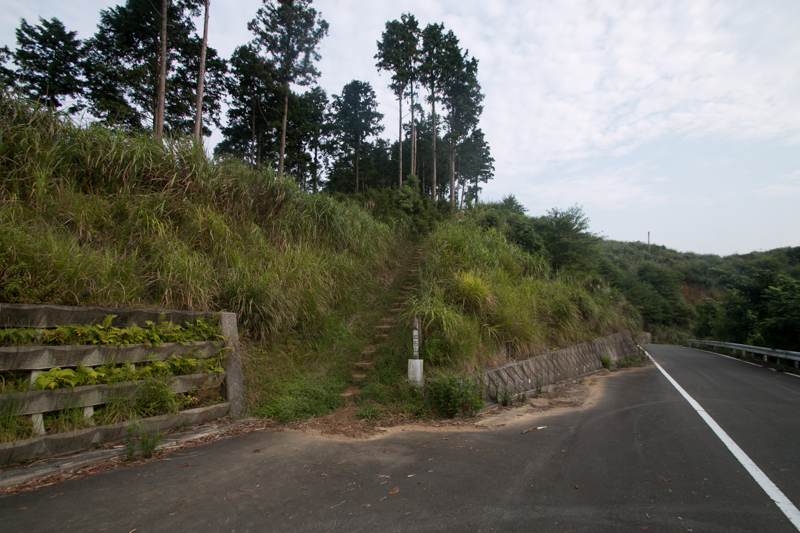 As a result, Hideyoshi marched to Satsuma province (Kagoshima prefecture), the main territory of Shimazu clan, by the end of April thus Shimazu clan gave up resistance and surrendered. As expected, forcible attack of Ganjaku castle brought quick settlement of the campaign. 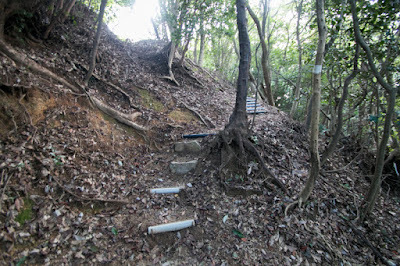 After the battle, Akizuki clan was moved to Hyuga province (Miyazaki prefecture) thus Ganjaku castle became the branch castle of Kokura castle held by Katsunobu Mouri (?-1611). 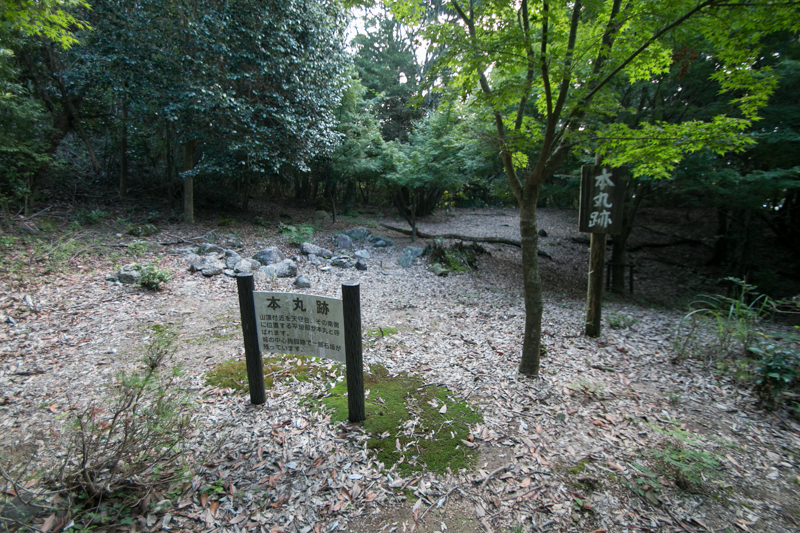 After the battle of Sekigahara in 1600, Mouri clan lost their territory then Buzen province was given to Tadaoki Hosokawa (1563-1646). 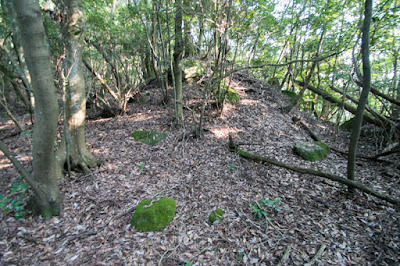 Ganjaku castle was kept as a branch castle of Hosokawa clan and reformed with stone walls, but was abolished by Ikkoku Ichijo-Rei (one domain one castle rule) published in 1615. 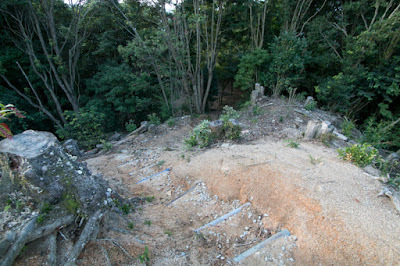 Now all building was lost but structure of castle still remain on the mountain. From the top of the castle a panoramic view of surrounding area is seen, and this shows the importance of Ganjaku castle. 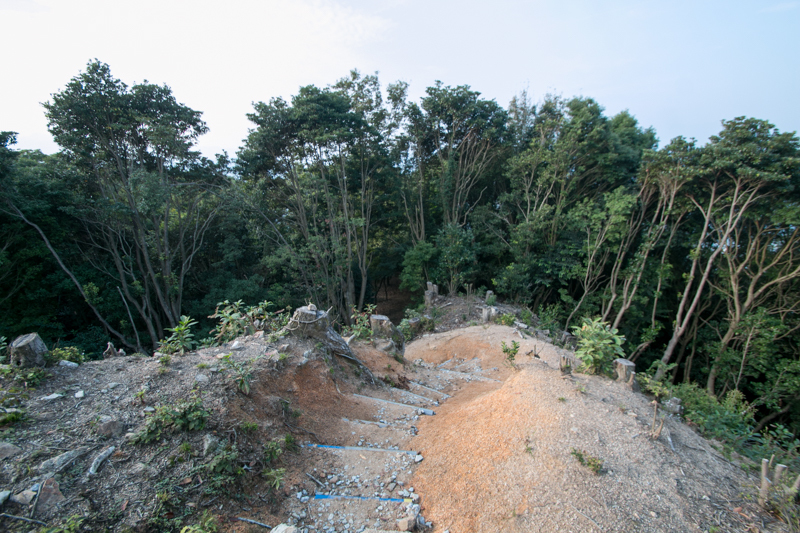 The castle itself is surely a secure one protected by natural bulwark such as cliffs and rocks, but also shows its limitation from size, access roads and limited defense facilities. 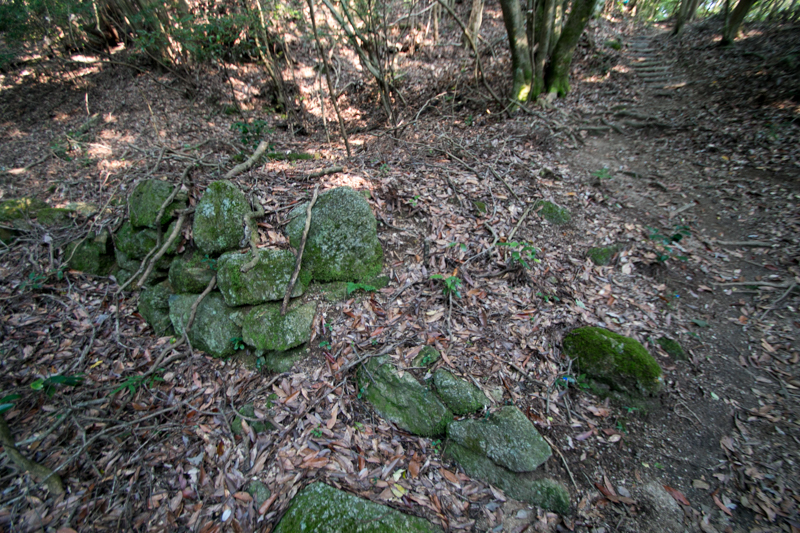 But attack by thousands of soldier is unexpected for this castle from first, and one day fall does not hurt the fame of Ganjaku castle. 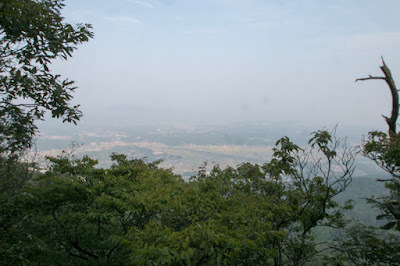 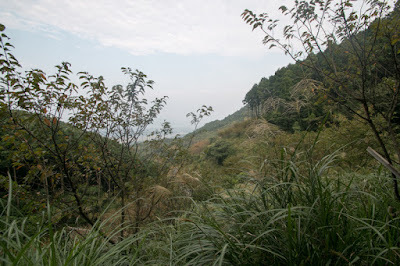 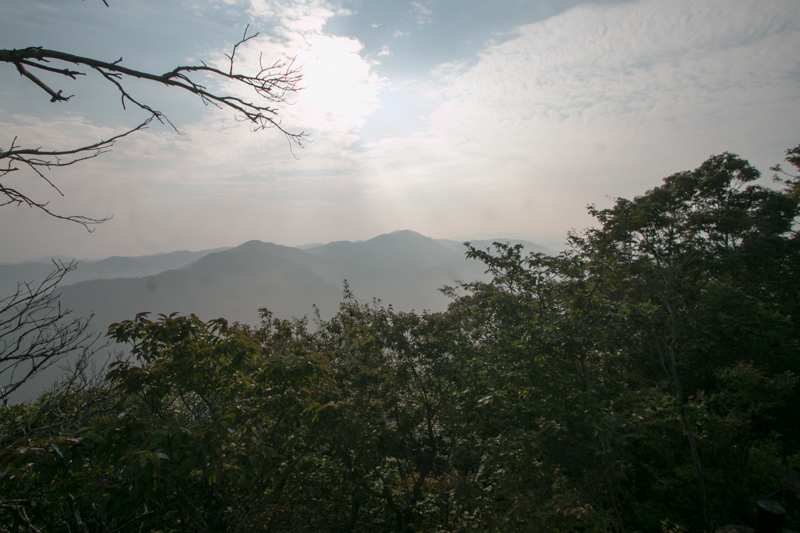 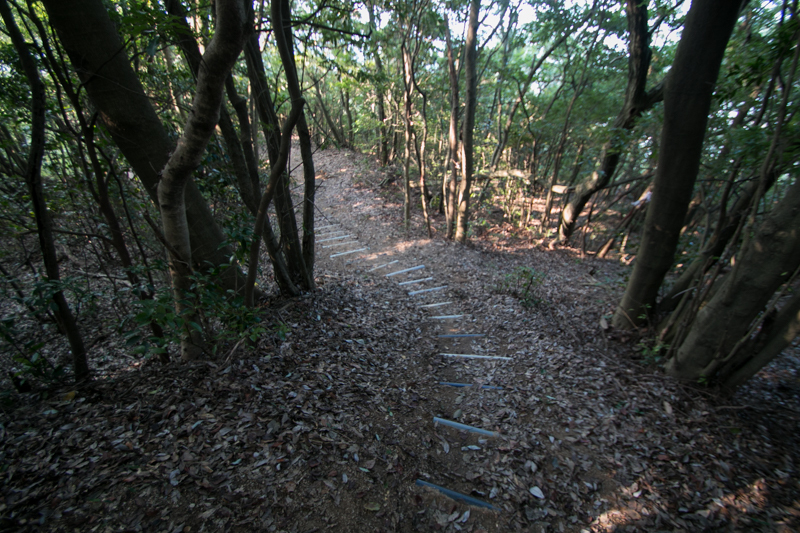 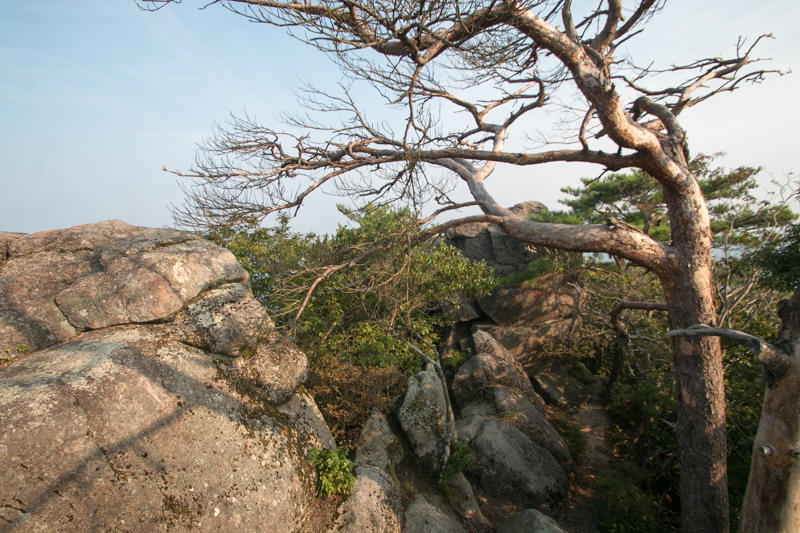 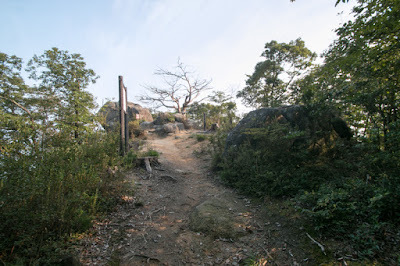 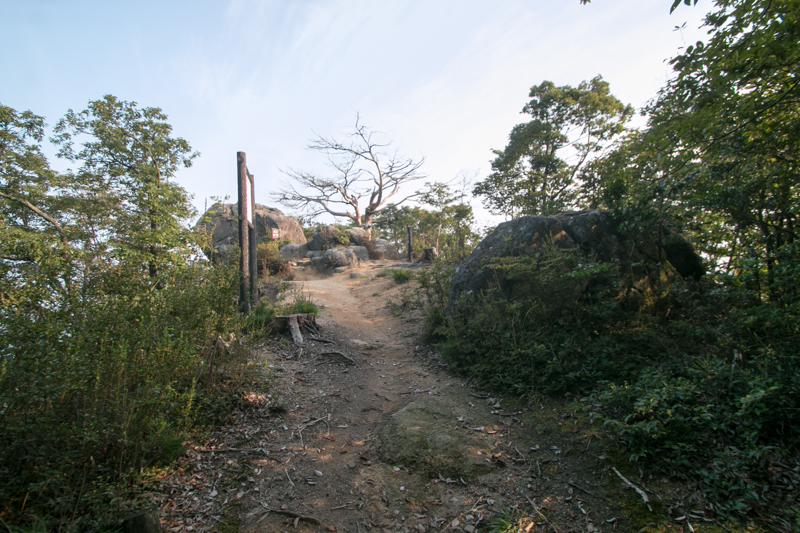 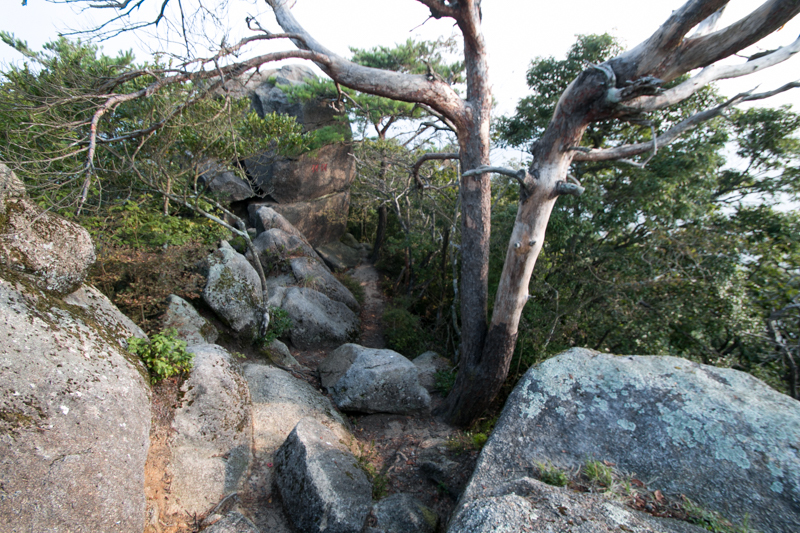 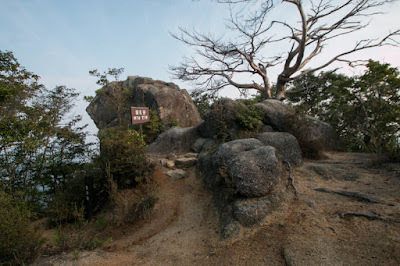 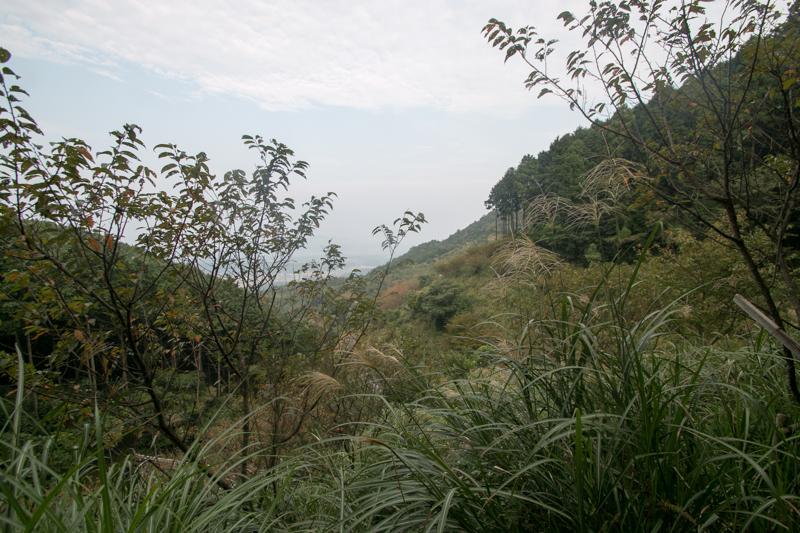 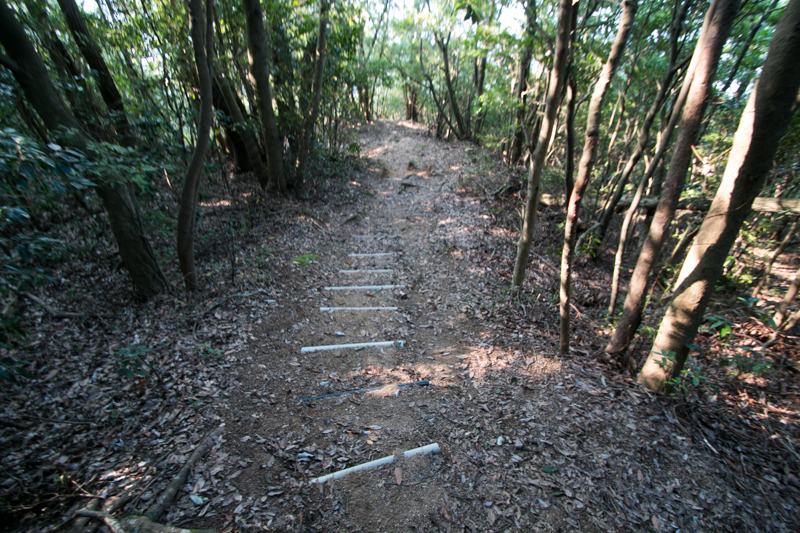 Today Ganjaku castle becomes popular good hiking course of local people, because of its perspective, moderate undulations and various climbing road. Its weak points as a castle now turned to be familiar as it is. 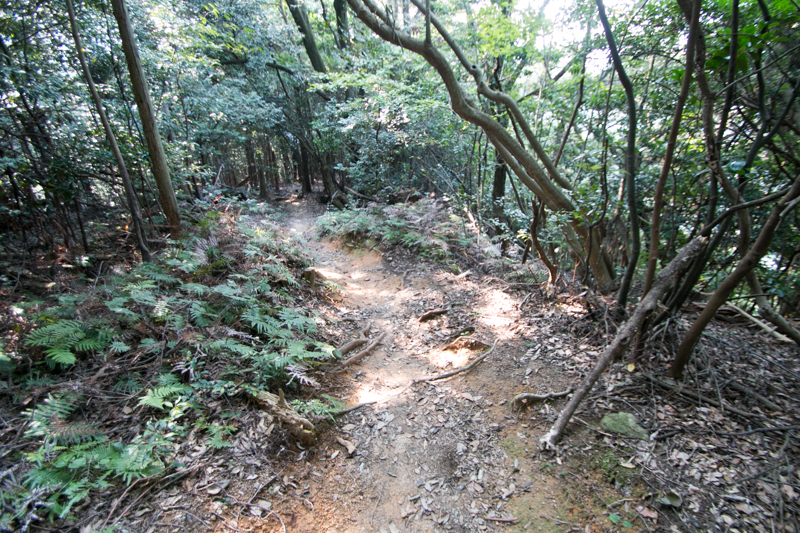 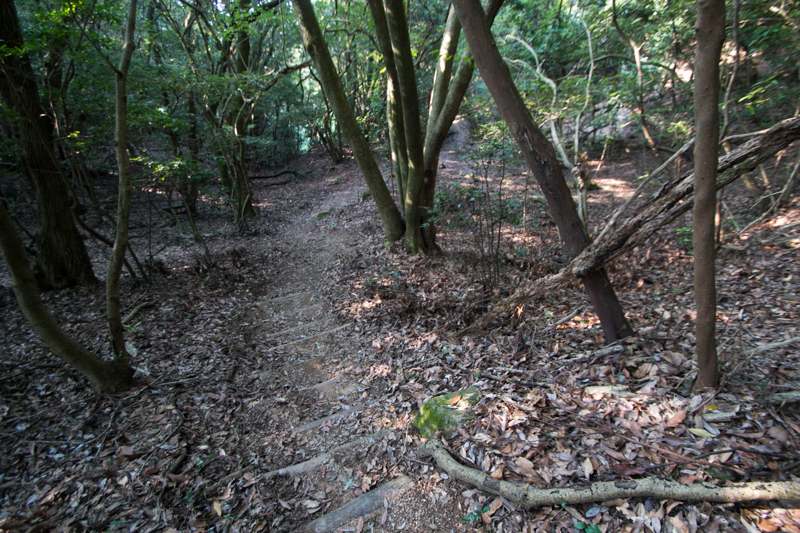 15 minutes walk from JR Kyushu Hita-Hikosansen line Soeda station. 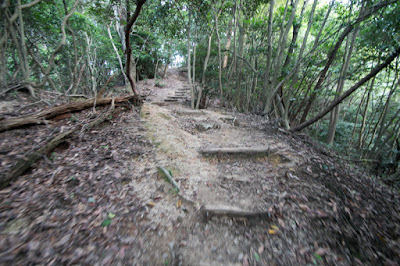 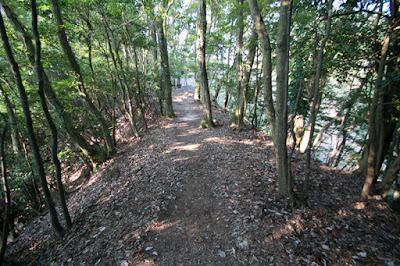 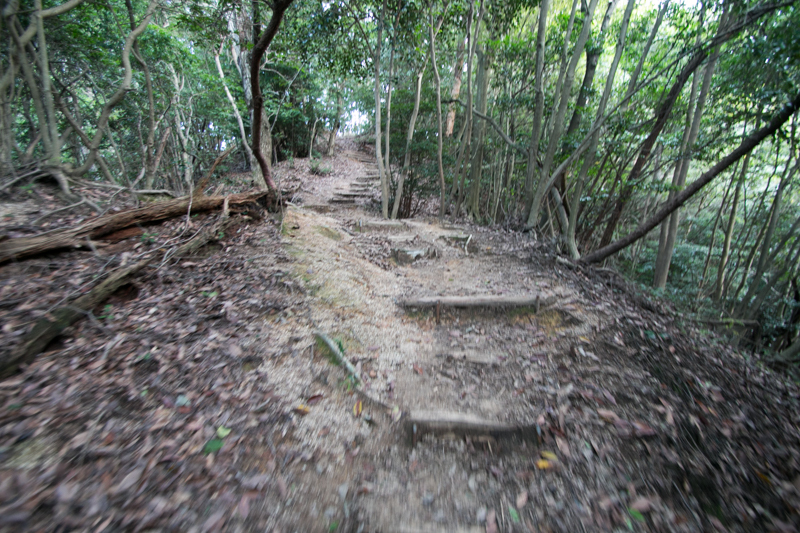 60 minutes walk from hillside to hilltop castle. 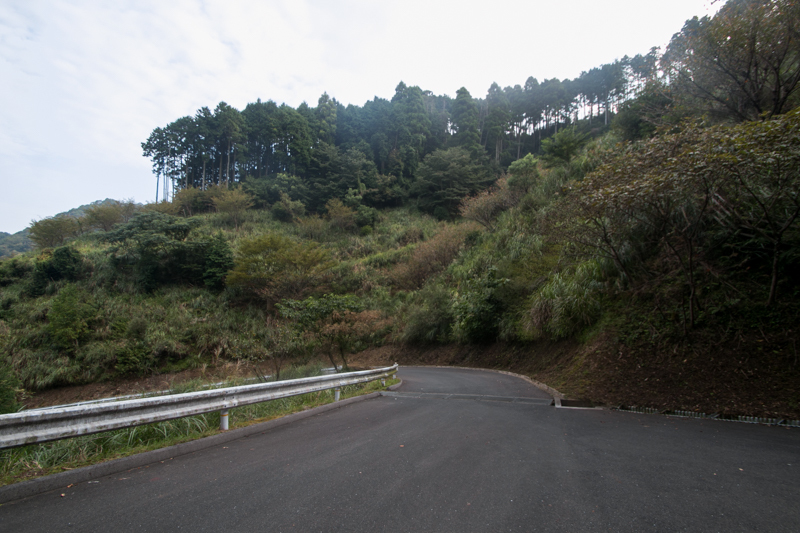 30 minutes drive from Higashi-Kyushu Jidoshado Expressway Yukuhashi interchange to hillside or halfway parking.